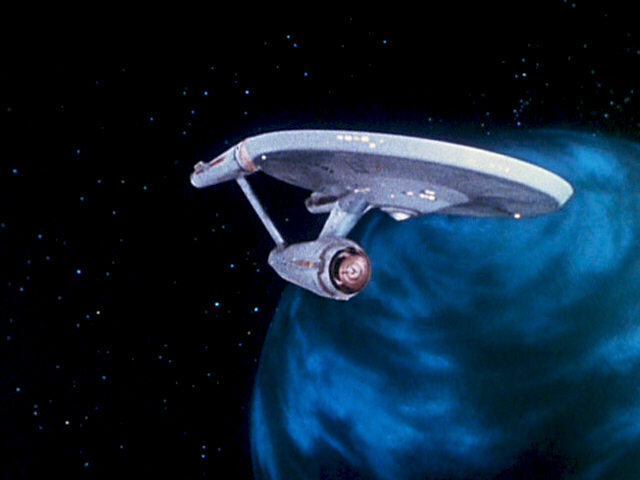 The Original Series, unlike the Star Trek sequels on TV and the movies, was not blessed with a wide variety of starships and other spacecrafts. With the exception of the USS Enterprise, its shuttles and perhaps the Klingon battlecruiser, the finish of the TOS starship miniatures used to be rather coarse. Several of them were re-used for different ships, which in some cases was very difficult to justify. A couple of vessels were represented by simple light effects, instead of an expensive and possibly hard to film miniature. In a few cases where it may have been useful to show what is going on outside the Enterprise, no other ship was shown at all. 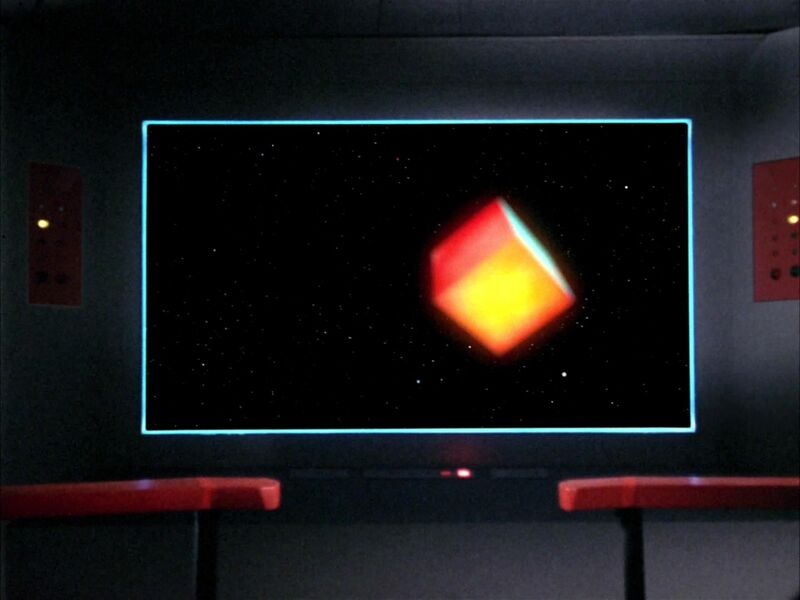 Thanks to CGI, these shortcomings were eventually corrected in the remastered version of Star Trek (TOS-R), produced by CBS Digital from 2006 to 2008. 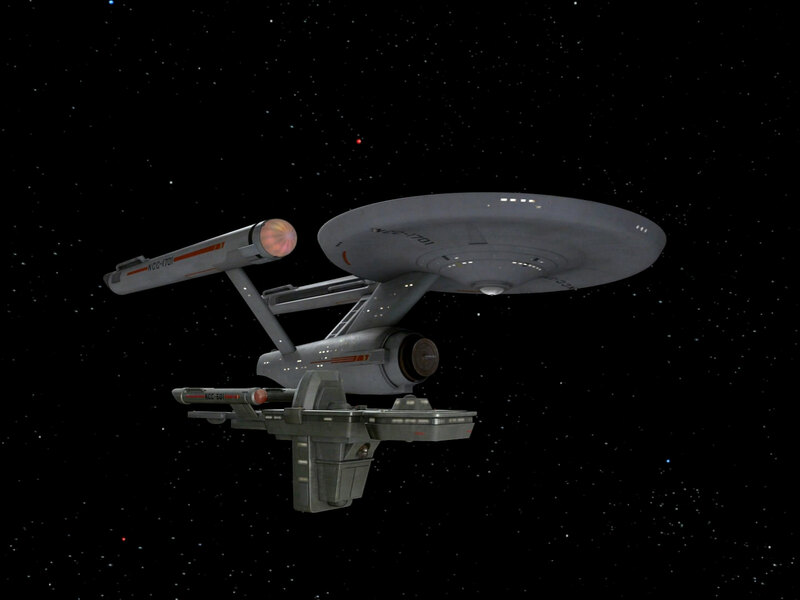 In TOS-R most of the starships, stations, shuttles and probes have have been given a distinct design. Nearly all of them were recreated digitally from scratch. 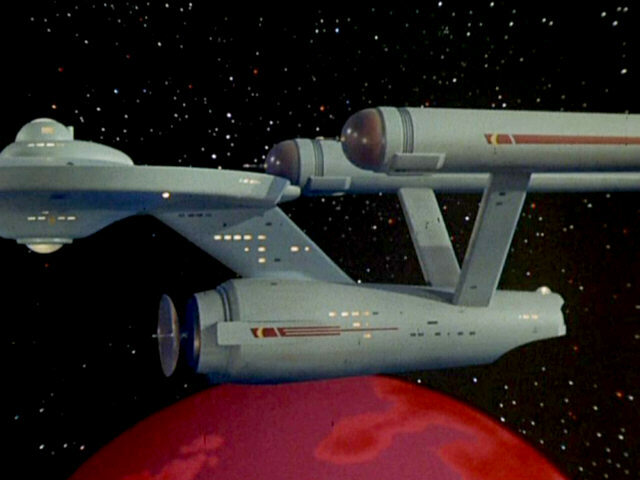 With some exceptions, notably the Enterprise and her shuttles, many were extensively altered compared to the TOS look. 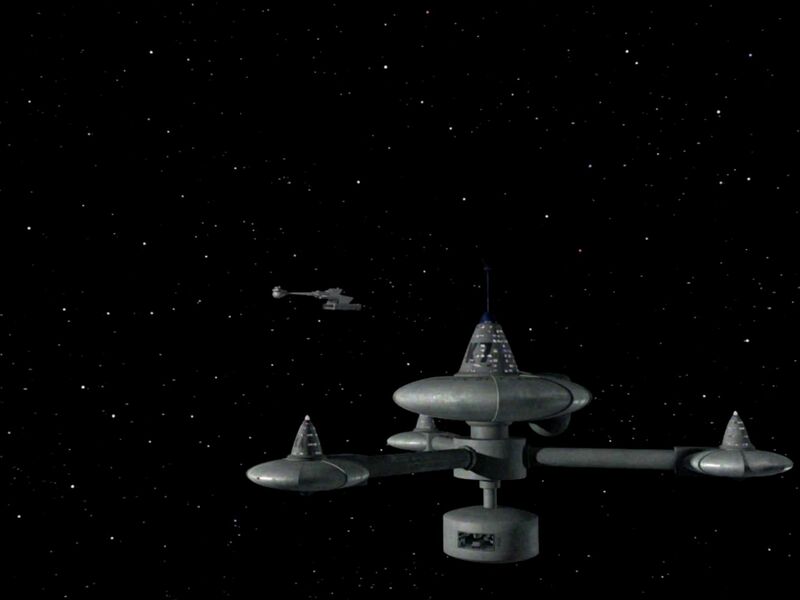 Our article shows all starships and other spacecrafts and stations that appeared in TOS, and how these were redone for TOS Remastered. They are usually listed chronologically, in the order of their appearance in TOS. 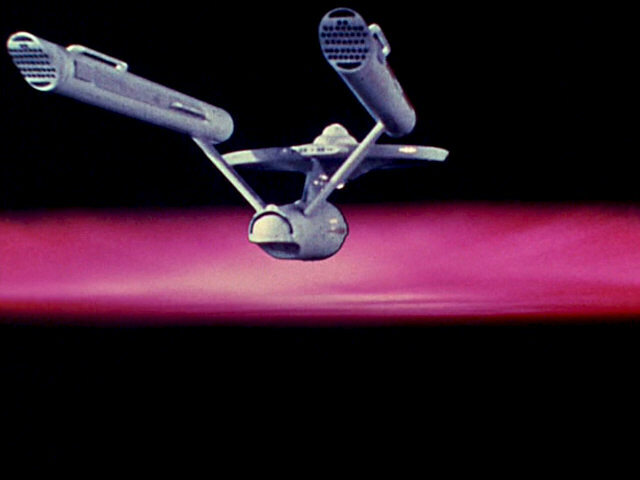 Our screen caps depict corresponding shots of TOS and TOS-R where possible. All headings and other classifications refer to the TOS versions of the vessels. 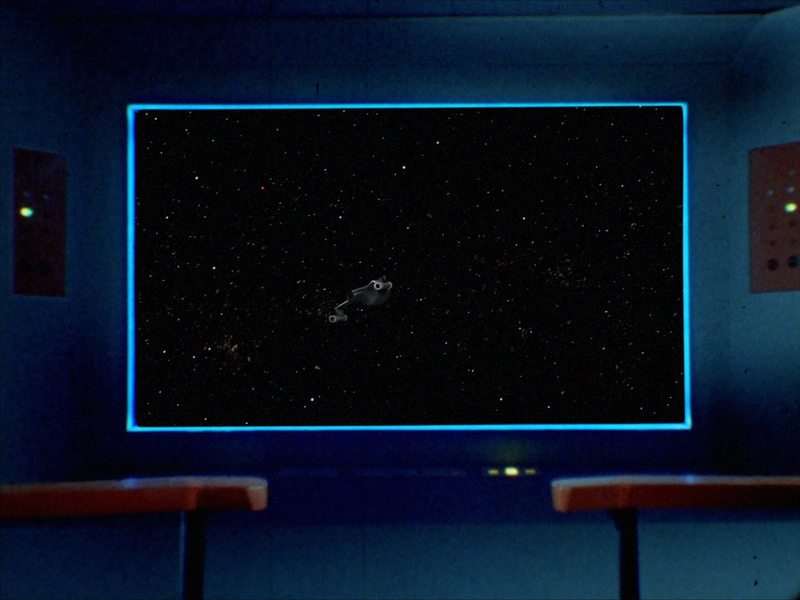 Matt Jefferies's original USS Enterprise NCC-1701 is naturally visible in every TOS episode. The big 11-ft model used for the principal filming was slightly modified between the "The Cage", the first pilot episode, and "Where No Man Has Gone Before", the second pilot, although no differences are discernible on screen. The model was modified much more extensively prior to the filming of the regular episodes. 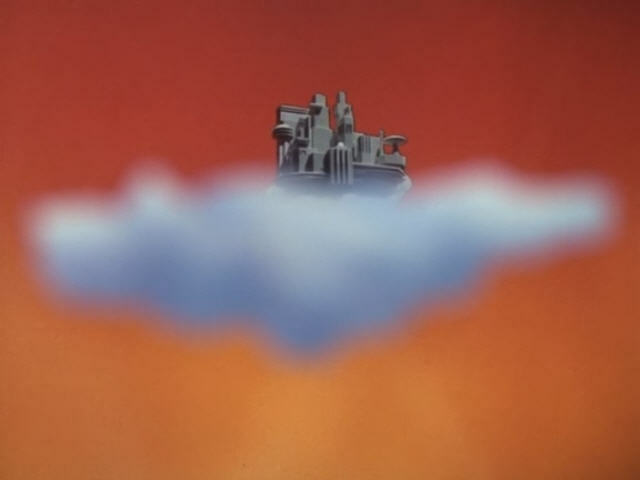 However, due to the use of stock footage the pilot version still occasionally showed up in regular episodes, although it would have been physically impossible. 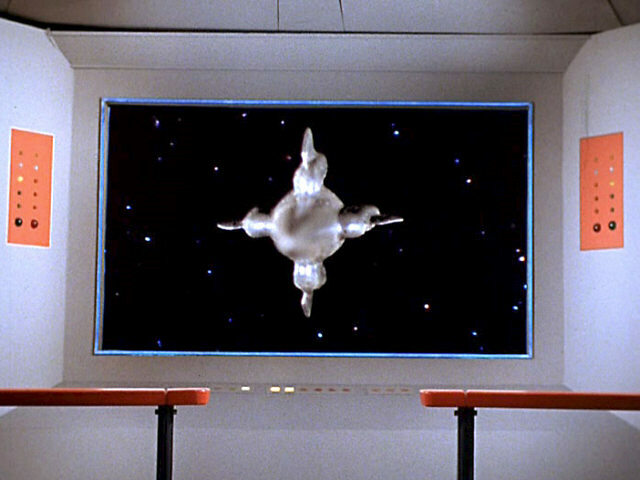 In TOS: "Mirror, Mirror", on the other hand, the pilot version of the miniature was used for the Mirror Enterprise to establish more of a visual difference to "our" Enterprise. 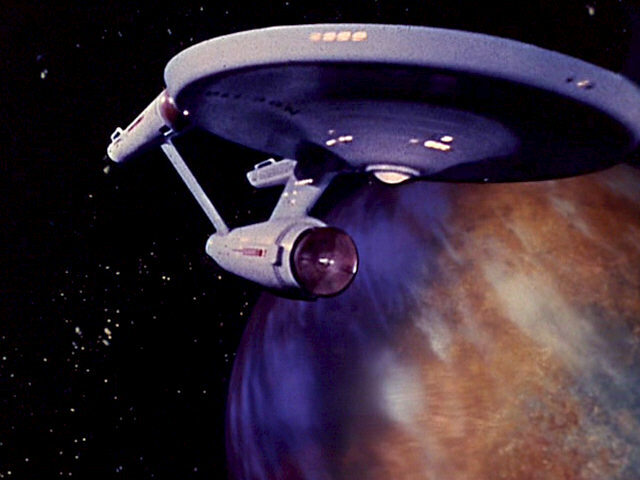 This is the model as it appeared in the first pilot "The Cage", in TOS: "The Menagerie" (the regular episode that recounted "The Cage" and hence re-used the footage of the pilot) and in TOS: "Where No Man Has Gone Before". 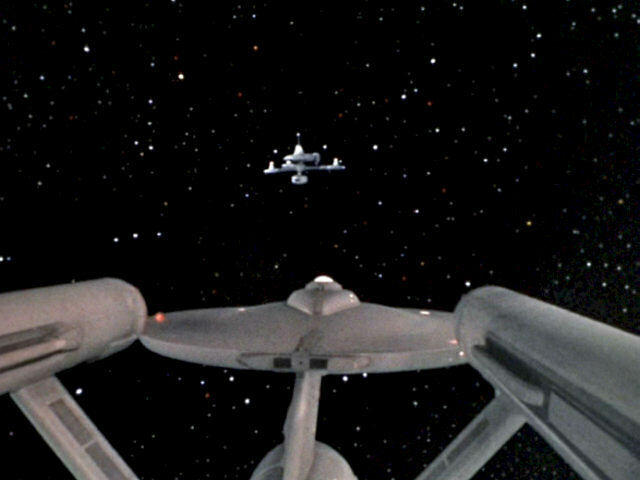 The most notable differences to the better known series Enterprise are the tall bridge dome, the black markings near the upper saucer edge, the larger deflector dish, the spires in the dark Bussard collectors and the perforated plate instead of the later ball on the nacelle aft ends. Pilot Enterprise ("The Cage", TOS: "The Menagerie") There is not a lot of footage of the pre-production Enterprise in TOS: "The Menagerie" and still not in the remastered episode. We can clearly see that the tall bridge dome, the nacelle spires and the larger deflector dish are still there. In addition, a newly created effect gives the impression of actually looking through the bridge dome inside the ship (in the Talosian transmission). 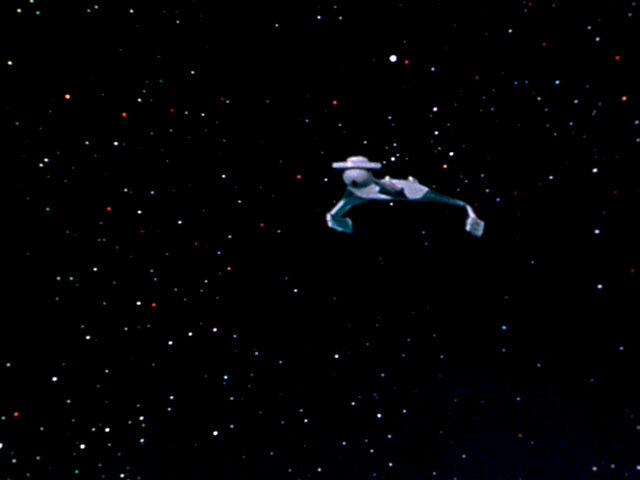 Pilot Enterprise (TOS: "Where No Man Has Gone Before") The episode shows the ship from various angles. It appears that the CGI in the remastered episode comprises most of the characteristic details, including a dark Bussard collector. 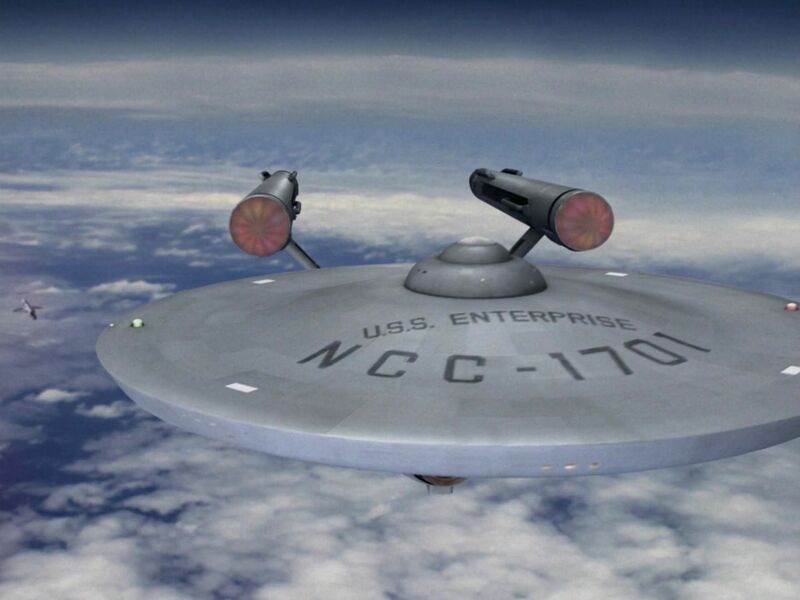 The two "NCC-1701" markings on the saucer underside should have the reverse orientation on this model, however. On the pilot Enterprise the port marking was readable in a front view, and the starboard marking was upside down. 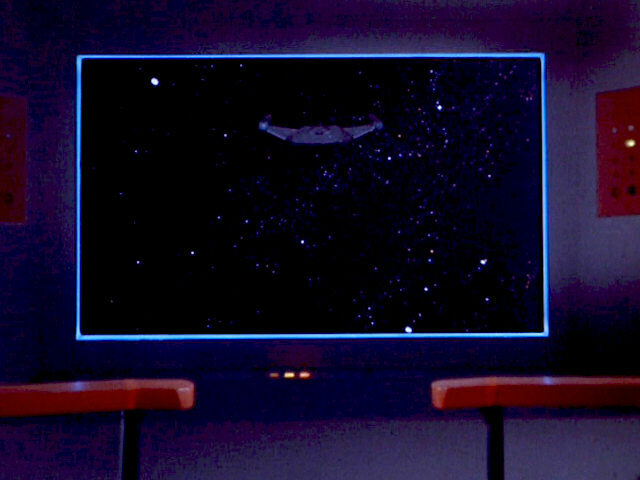 Mirror Enterprise (TOS: "Mirror, Mirror") Usually the ship always moved across the screen from left to right because only the starboard side could be illuminated. 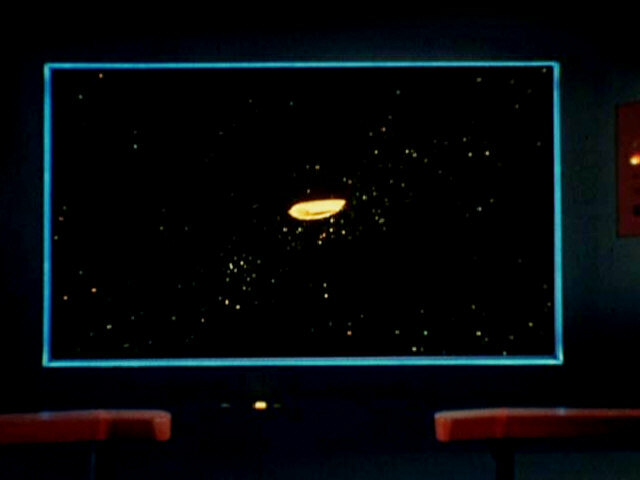 In order to accomplish the "mirror" effect for the Mirror Universe vessel in the TOS episode, footage of the pilot Enterprise was reversed, and the "NCC-1701" decal later flipped back into its normal orientation. 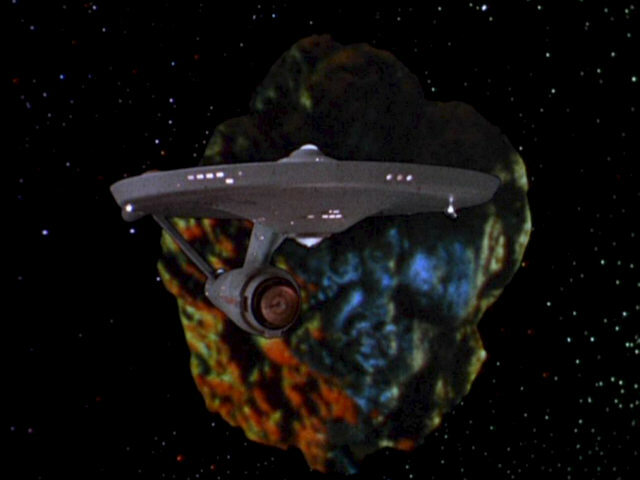 This technique was reconstructed with the pilot version CGI for the TOS-R episode. 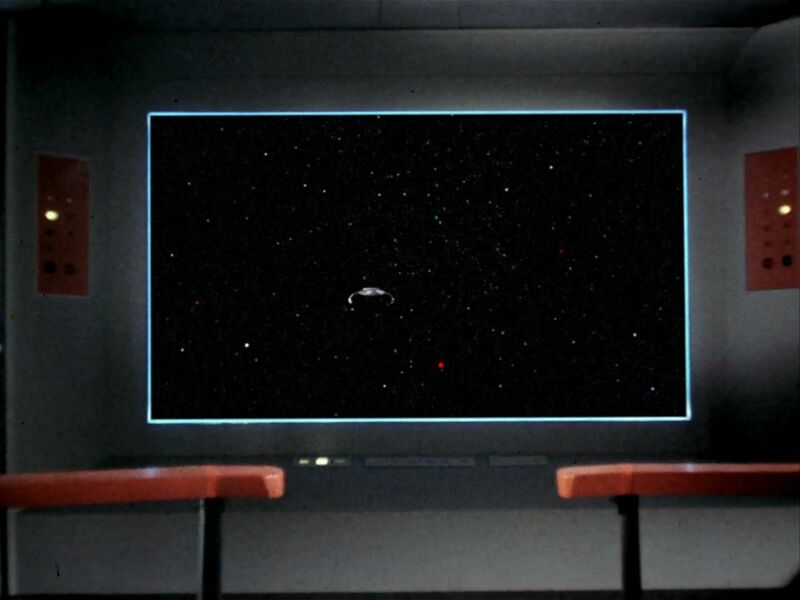 Mike Okuda: "We used the 'Where No Man' version of the Enterprise for 'Mirror, Mirror' to pay homage to the transition sequence in the original version of the episode." Wrong pilot Enterprises in regular episodes There are many re-uses of the pilot Enterprise in regular episodes, albeit with decreasing frequency in later seasons as it seems. 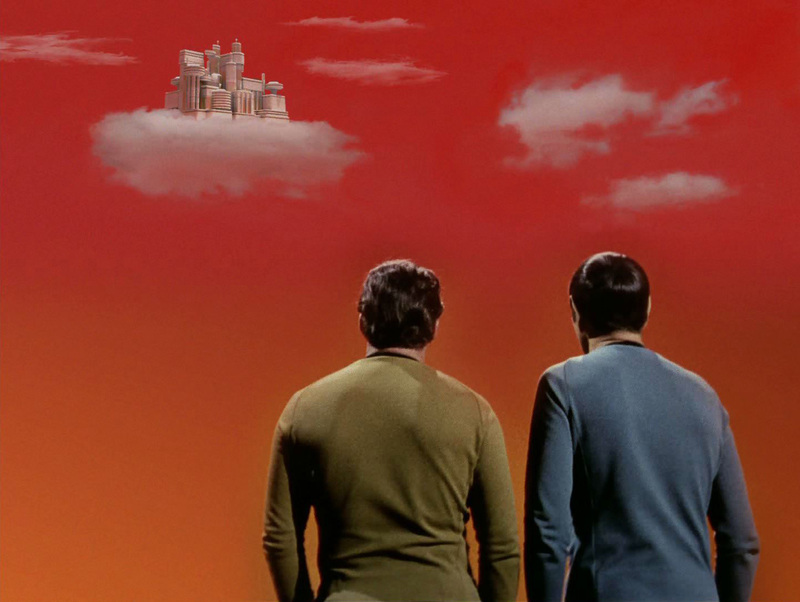 The pilot version still shows up in the closing shot of TOS: "Day of the Dove", for instance. All of these errors have been fixed. 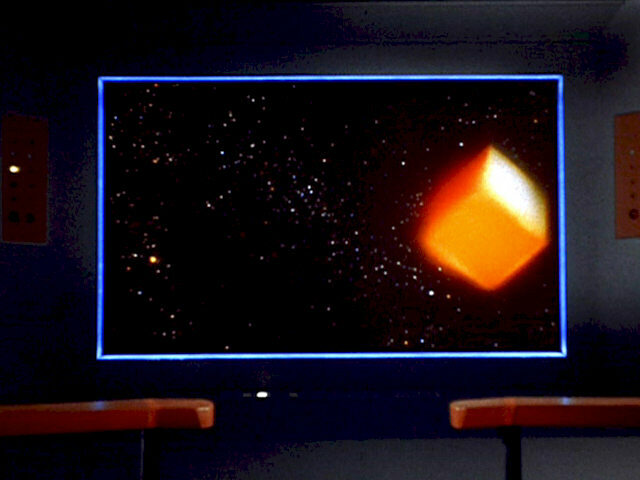 TOS-R consistently shows the series version of the CGI. Our examples are from "Mudd's Women", "Charlie X" and "Arena". The bridge dome was lowered. The black markings at the edge of the dorsal saucer surface around the position lights were removed. A "spinning lights" effect was added inside the previously opaque looking Bussard collectors. The spikes on the Bussard caps were removed. The grilles on the nacelle aft ends were replaced with white balls. The deflector dish diameter was reduced. Ribs were added to the partially submerged box on either side of the deflector housing. 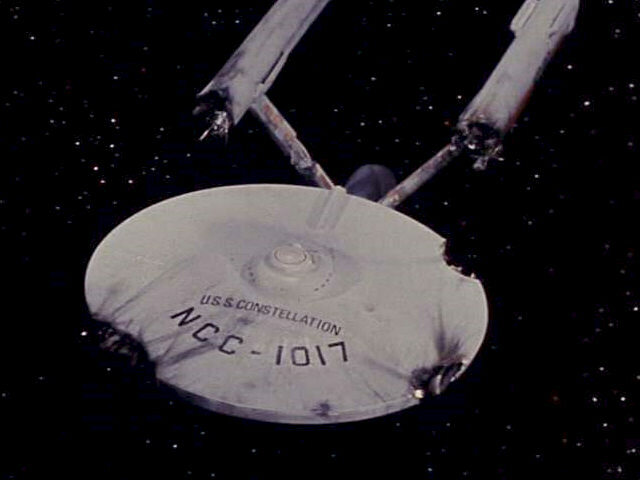 The orientation of the two "NCC-1701" markings on the lower saucer surface was reversed (left and right markings swapped). 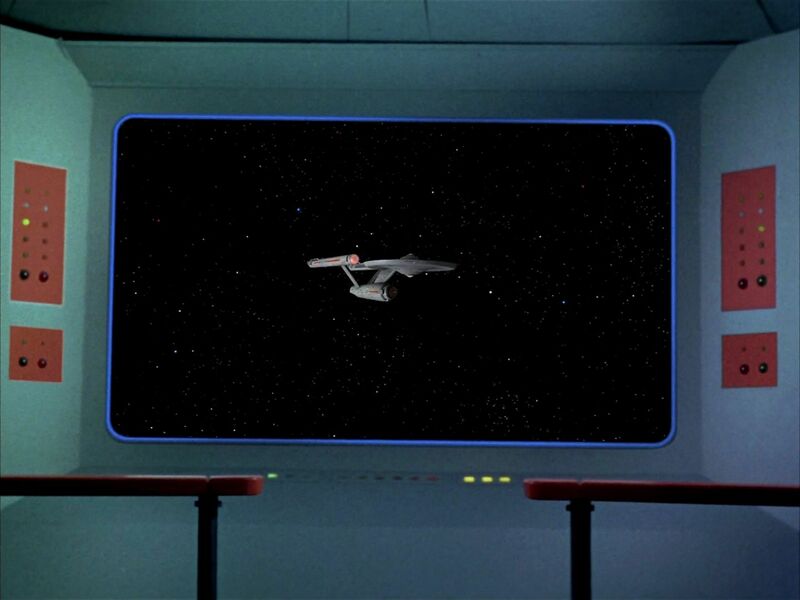 Series Enterprise in regular episodes All shots of the physical model without exception were replaced with CGI for TOS-R. 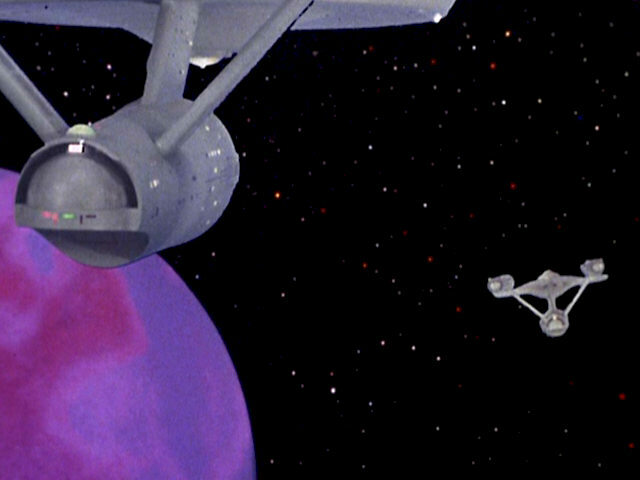 In some cases the CGI sequences reconstruct the original TOS shot, showing the ship from essentially the same angle. 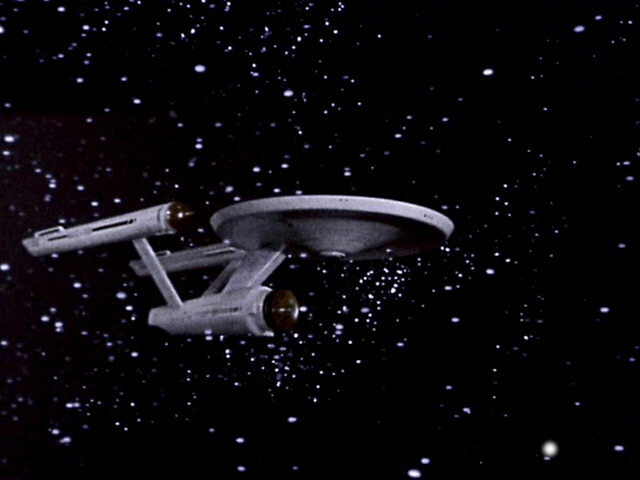 Overall, however, there is much more variety in TOS-R than was possible with the old 11-ft Enterprise miniature, such as the shuttle departure in TOS-R: "The Galileo Seven" or the Enterprise in the atmosphere in TOS-R: "Tomorrow is Yesterday". TOS-R: "Court Martial" shows extreme close-ups of the ship's aft end and burn marks on the hull. Also, light effects were refined or newly created. The impulse engines are now lighted red when the ship is moving. 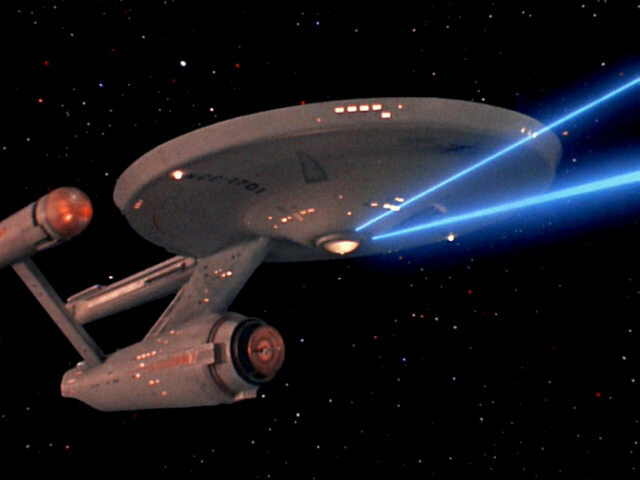 The look of the weapons is consistent in TOS-R (phasers: blue continuous beams, photons: red bolts). 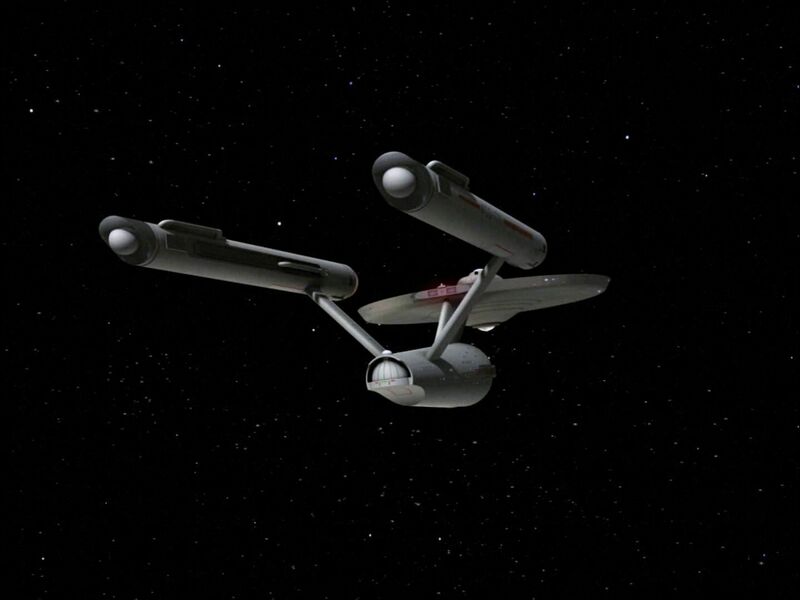 The customarily too wide angle of the twin phaser beams in TOS was fixed as well. 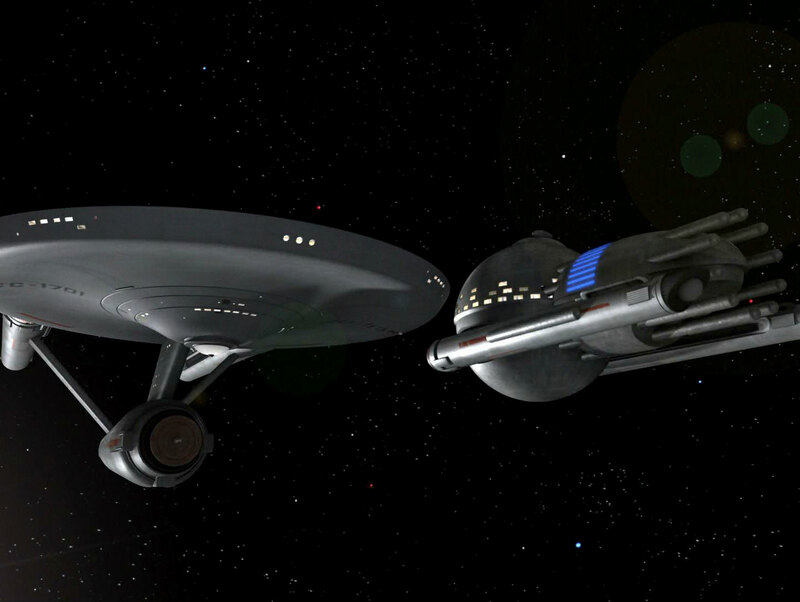 Owing to budget restrictions, practically all other Starfleet ships in TOS belonged to the same ship class as the Enterprise. 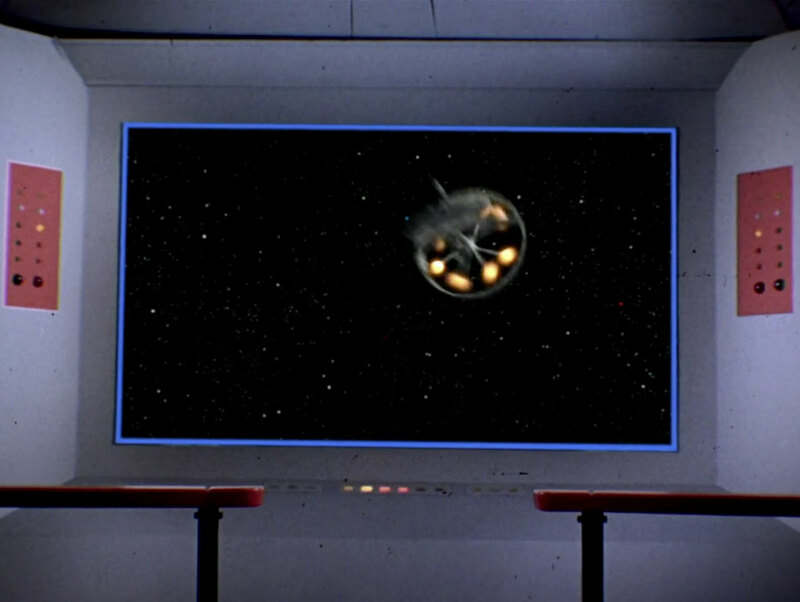 While usually the unchanged Enterprise model was used to shoot other ships of the class, a simple AMT plastic model was damaged to serve as the USS Constellation NCC-1017 in TOS: "The Doomsday Machine". 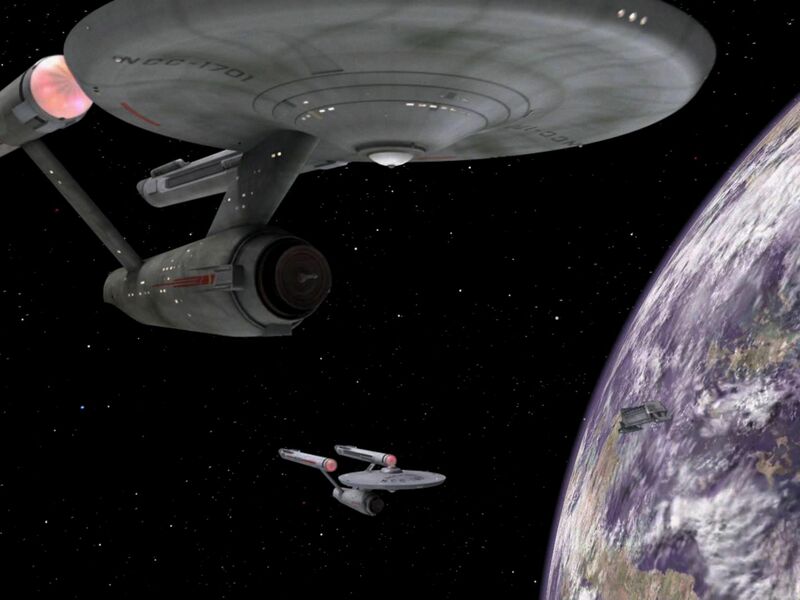 USS Intrepid (TOS: "Court Martial") In TOS-R, a CGI scene that includes the Intrepid with the registry NCC-1631 in the background replaces a generic "Enterprise with planet" shot. 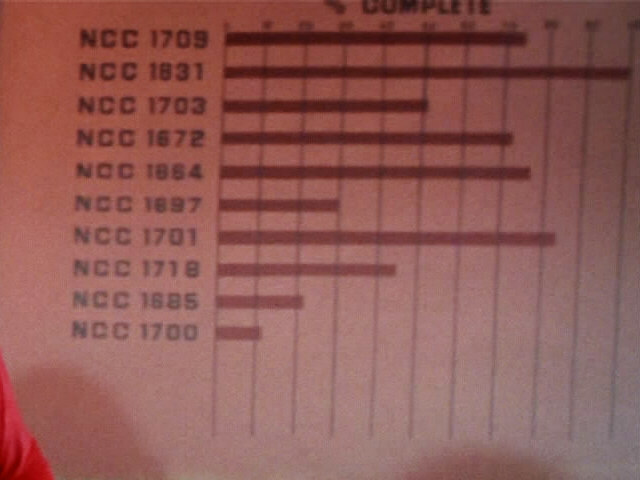 Although it would not have been mandatory, this registry cannot be found on the wall chart in Stone's office that lists an "NCC-1831". But the latter could be any other ship, also taking into consideration that the bar shows 100% completion, whereas Stone verbally states that work on the Intrepid would be postponed in favor of the Enterprise. 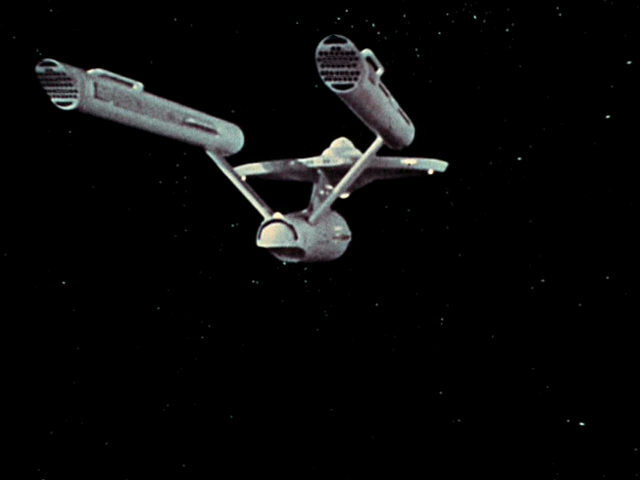 USS Constellation (TOS: "The Doomsday Machine") In TOS the Constellation NCC-1017 was just a plastic model damaged with a soldering iron. 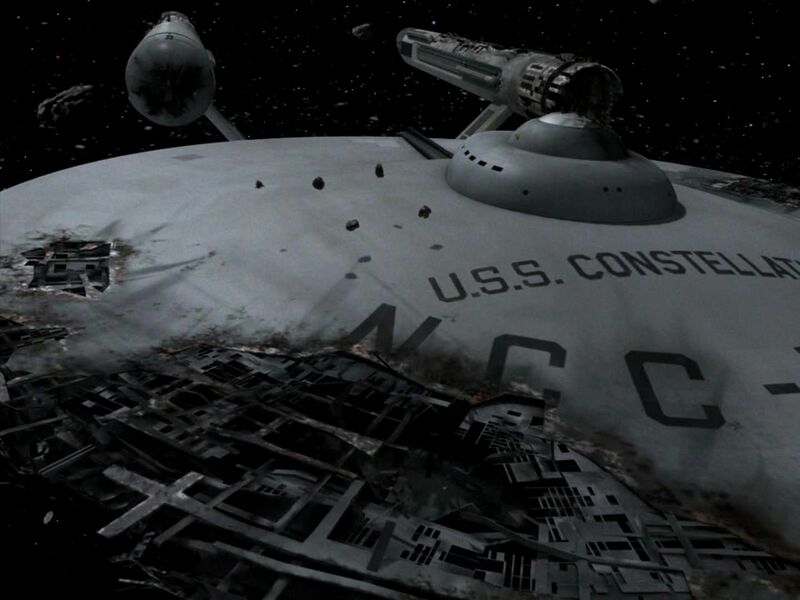 For TOS-R a fully fledged CGI of the Constitution class was built with extensive damage. 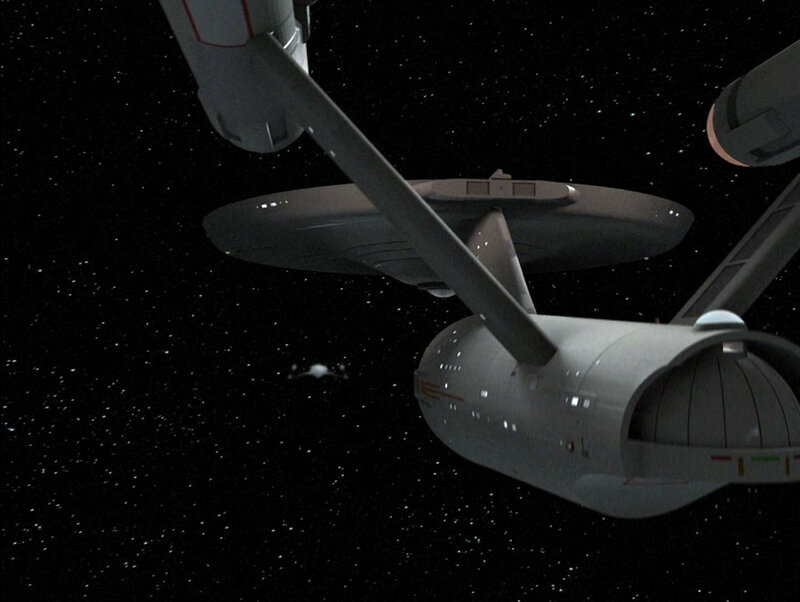 USS Exeter (TOS: "The Omega Glory") Like the Enterprise too, the Exeter was replaced with a CGI model, bearing the registry NCC-1672. 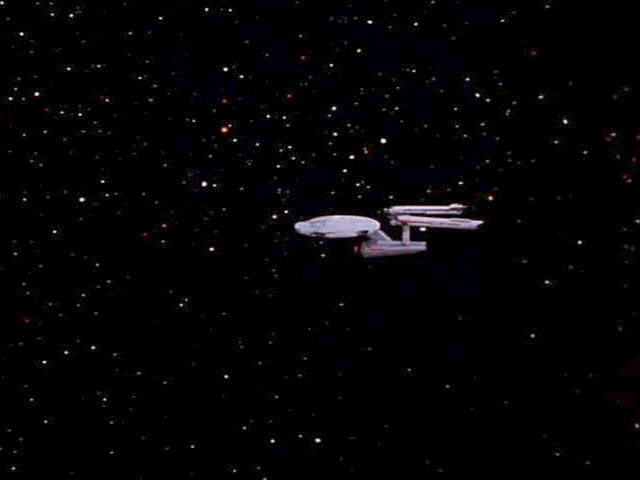 USS Defiant (TOS: "The Tholian Web") Like the Enterprise too, the USS Defiant NCC-1764 (that also appeared in ENT: "In a Mirror, Darkly") was replaced with a CGI model. 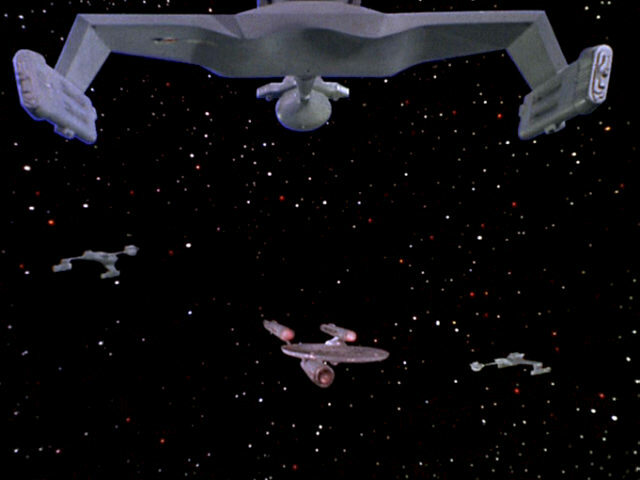 In TOS: "The Ultimate Computer" the Enterprise, equipped with the revolutionary M-5 computer, faces four other vessels of the same class in a simulated battle. 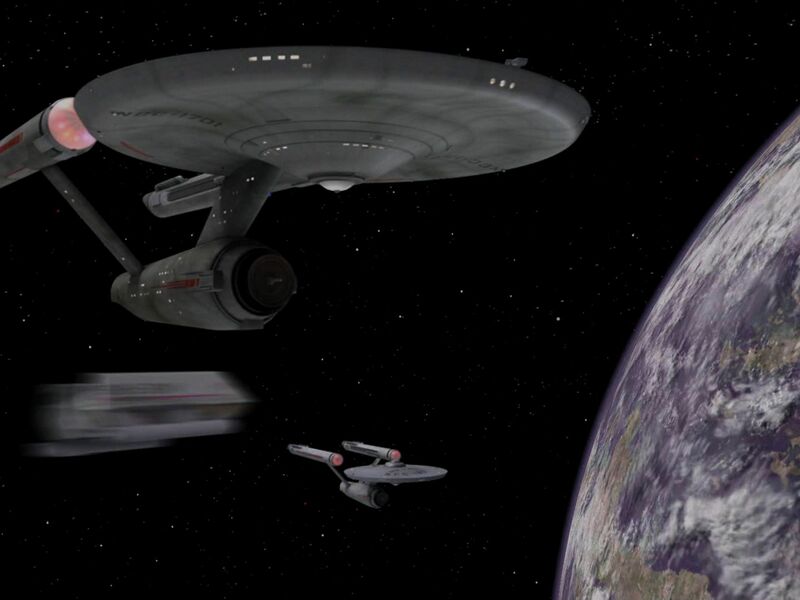 The other ships are: USS Hood NCC-1703, USS Lexington NCC-1709, USS Excalibur NCC-1664, USS Potemkin NCC-1657. 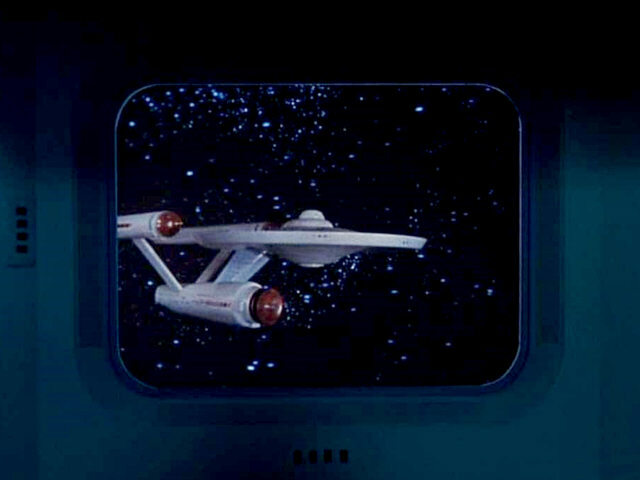 None of the registries was visible in the TOS episode, owing to the fact that the unchanged Enterprise model was used and none of the ships could be seen in a close-up. 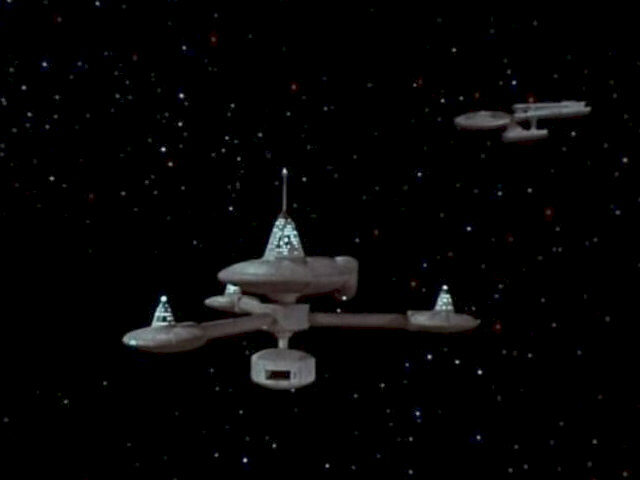 Four Constitution-class ships (TOS: "The Ultimate Computer") The remastered episode shows the four other Constitution-class vessels from more different angles than before, and with the so far tentative registries. There are slight variations in the ship designs, such as on the Lexington that has four windows at the very front end of the saucer instead of three. Mike Okuda: "We changed the window patterns slightly on the four guest ships in 'The Ultimate Computer,' keeping the deck lines the same... 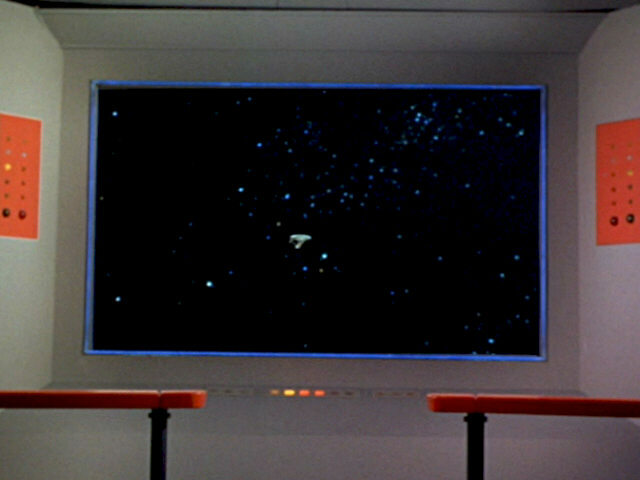 There's also a single shot of the main viewscreen on the Lexington bridge in which we modified the screen slightly from the stock Enterprise screen." 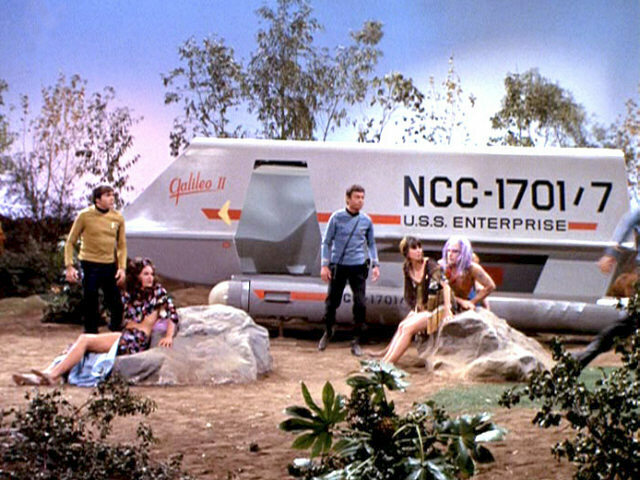 The Enterprise's shuttlecraft appeared in eight TOS episodes. 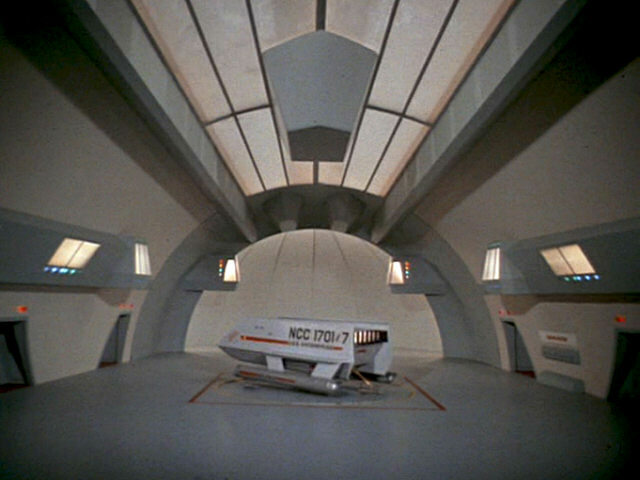 The full-scale model was finally re-labeled "Galileo II" in TOS: "The Way to Eden" (last shuttle appearance). 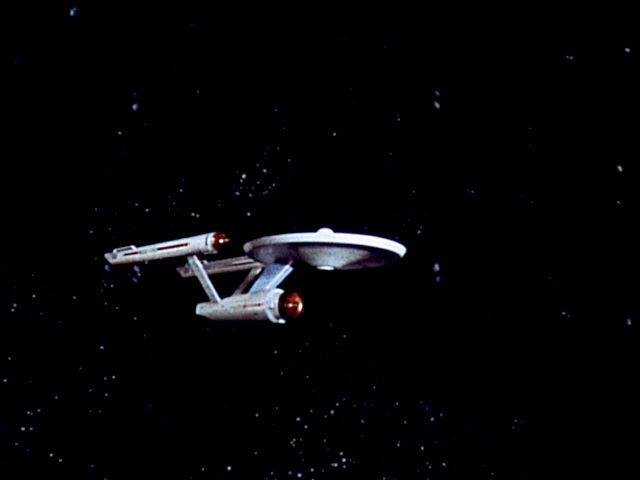 However, all shots of the miniature without exception show the Galileo NCC-1701/7 that was destroyed as soon as in TOS: "The Galileo Seven" (first shuttle appearance). At least on two occasions this is unquestionably wrong, because these shuttles do not even belong to the Enterprise. 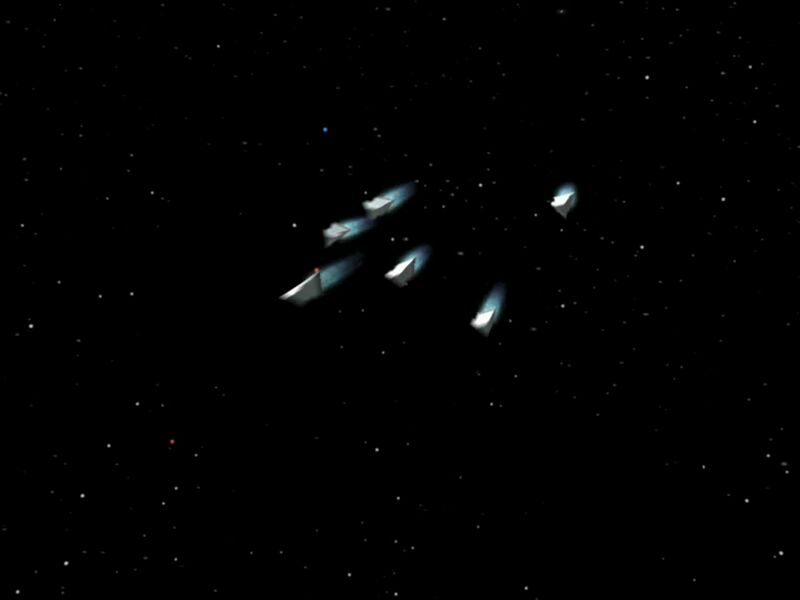 Shuttles (TOS: "The Galileo Seven") All shots of the shuttle models were replaced with new CGI effects. 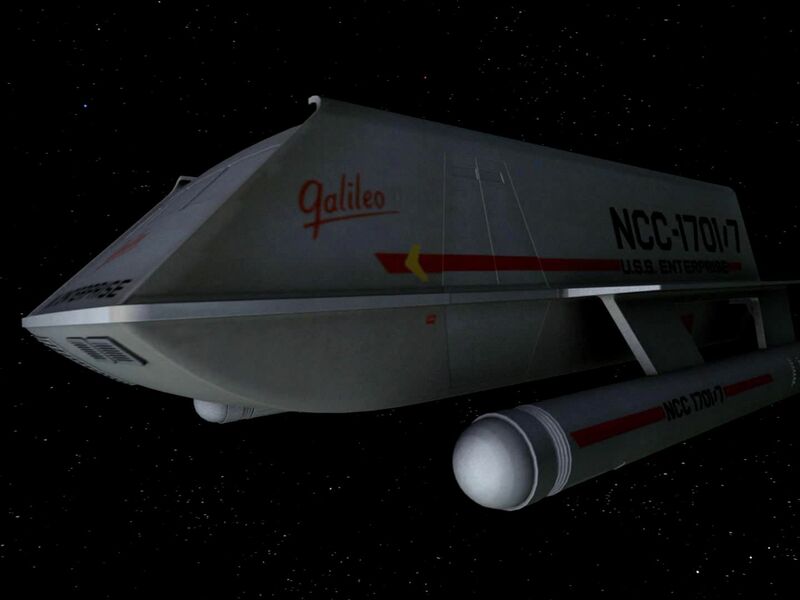 Most notably, there are now two shuttles with correctly individual registries, the Galileo NCC-1701/7 and the Columbus with the previously unseen NCC-1701/2. Starbase 11 shuttlecraft (TOS: "Court Martial", "The Menagerie, Part I") A previously unseen shuttle was inserted at the beginning of TOS-R: "Court Martial", apparently inspecting the damage on the Enterprise around the ion pod after the ion storm. It is the Picasso SB11-1201/1. 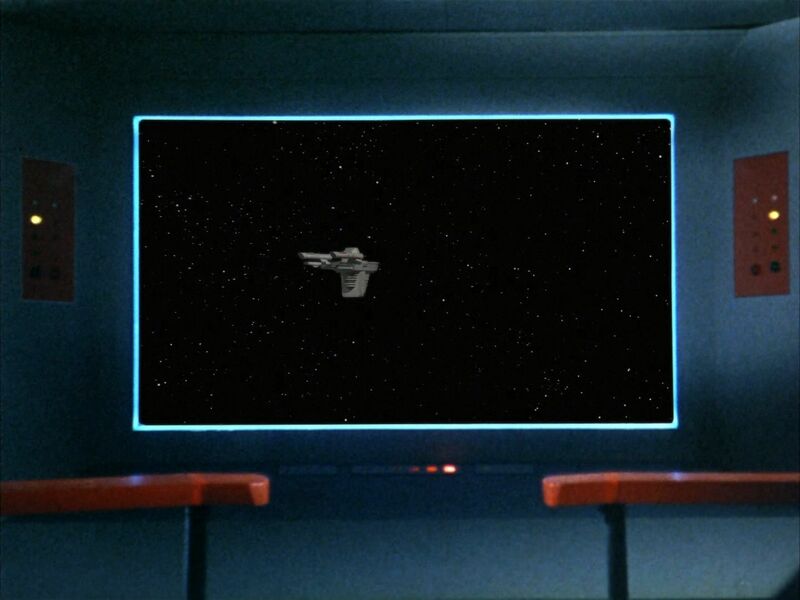 When Kirk and Mendez take a Starbase 11 shuttlecraft and try to catch up with the hijacked Enterprise in TOS: "The Menagerie, Part I", the inadequate stock footage of the Galileo shuttle was replaced with new CGI scenes for TOS-R, correctly showing a shuttle assigned to Starbase 11. It is once again the Picasso. 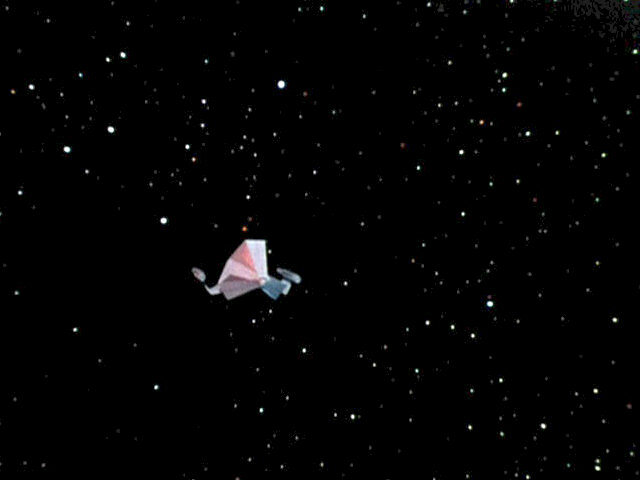 Shuttlecraft Galileo (TOS: "Metamorphosis", "Journey to Babel", "The Immunity Syndrome") Some TOS episodes used stock footage of the destroyed Galileo NCC-1701/7 before the model was le-labeled "Galileo II" for "The Way to Eden". TOS-R: "Journey to Babel" retains the name Galileo and its registry as in TOS, apparently because there are close shots with the full-scale model. 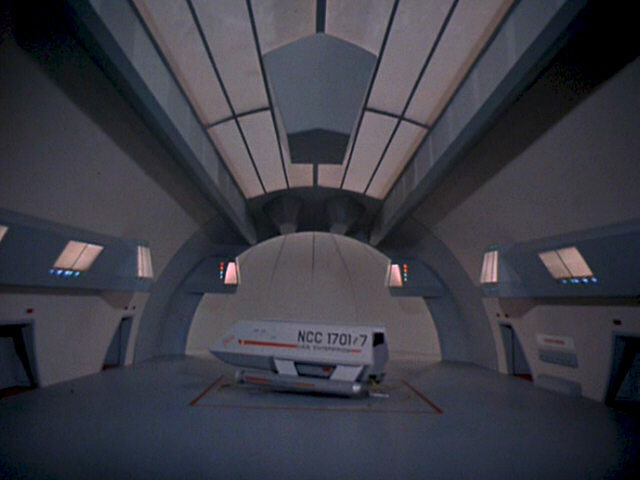 The episode also shows the Columbus NCC-1701/2 as already in TOS-R: "The Galileo Seven". 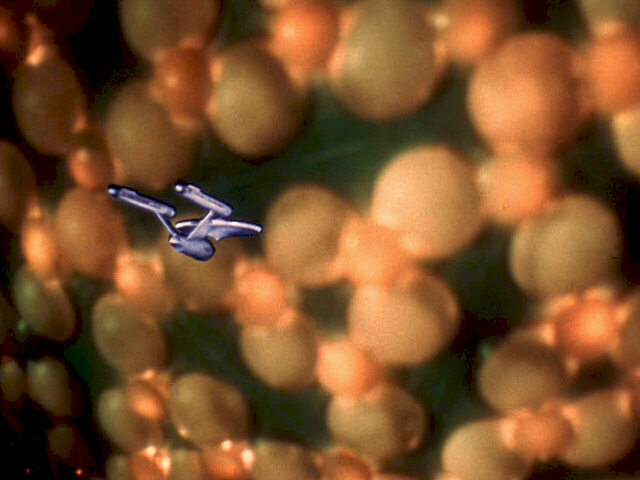 Likewise, we can still see the Galileo NCC-1701/7, now as a CGI, in TOS-R: "Metamorphosis" and "The Immunity Syndrome". 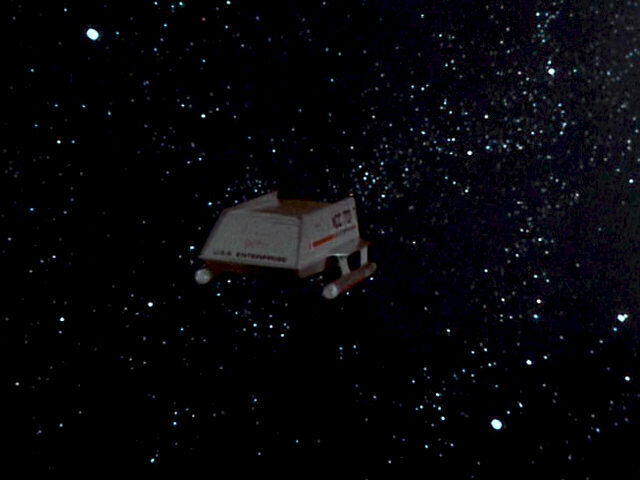 Shuttlecraft (TOS: "The Doomsday Machine") In this one episode the stock footage of the Galileo was not replaced with a CGI with the same number. The reason is that this very shuttle would be destroyed again when Decker steers it into the Planet Killer, requiring yet another Galileo for later episodes. This would have been a stretch. The fixed labeling is "Einstein NCC-1701/6". 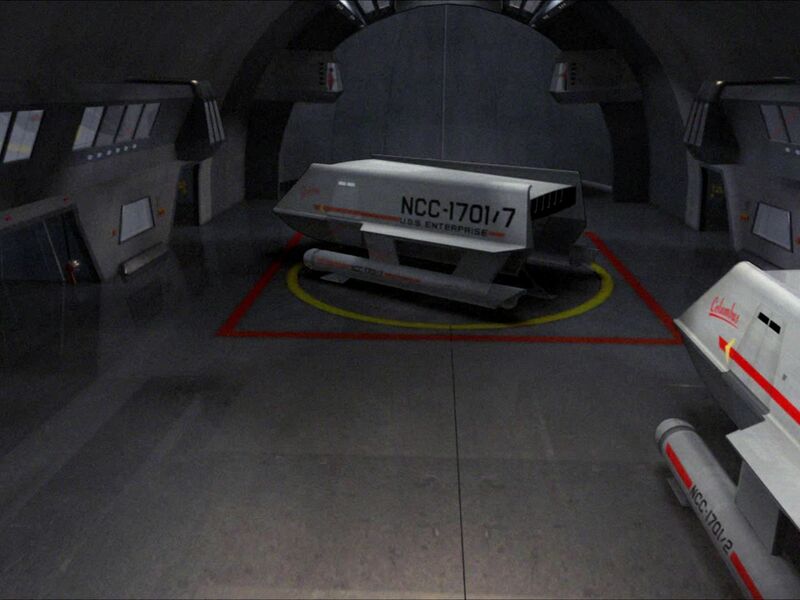 Starbase shuttlecraft (TOS: "Let That Be Your Last Battlefield") The evidently wrong registry of the shuttle that was stolen from a starbase as "NCC-1701/7" was fixed in TOS-R. The corrected lettering is "Da Vinci SB4-0314/2". Shuttlecraft Galileo II (TOS: "The Way to Eden") For the TOS episode the 1/1 scale shuttle was re-labeled "Galileo II", finally accounting for the destruction of the Galileo two seasons earlier. There are no new effects of the shuttle in the remastered episode. 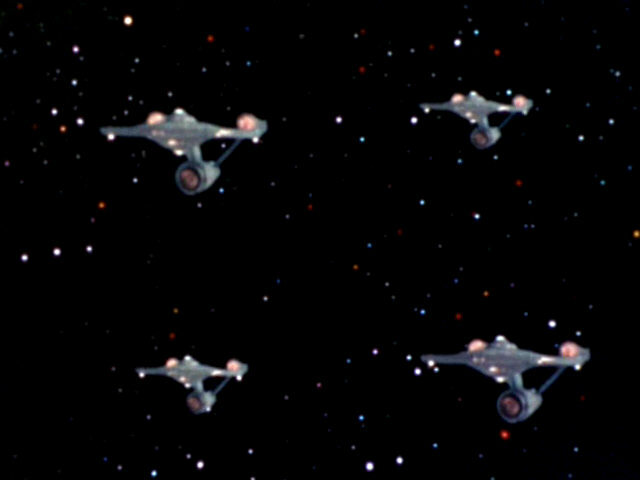 The following starships were re-used during TOS. Many of them were redesigned for TOS-R for the sake of more diversity. 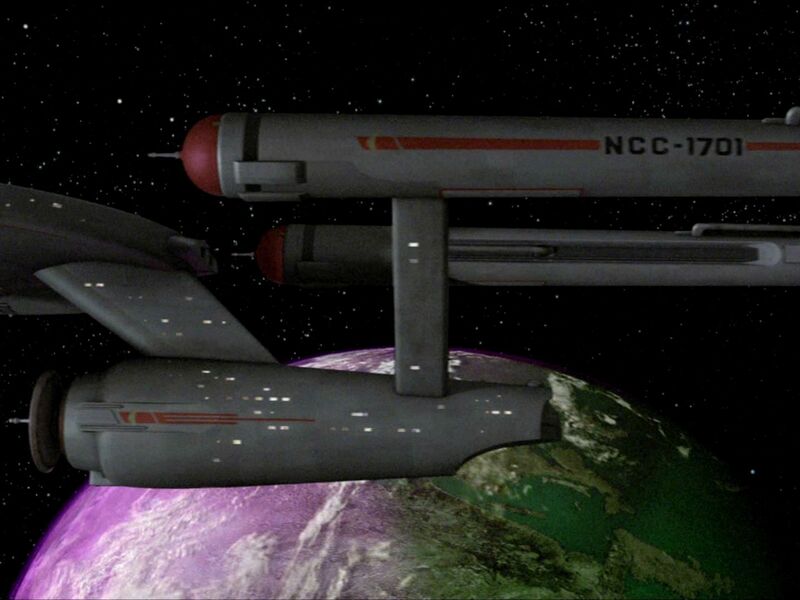 The Botany Bay is established as a sleeper ship from the late 20th century in TOS: "Space Seed", naturally without warp or only impulse drive. 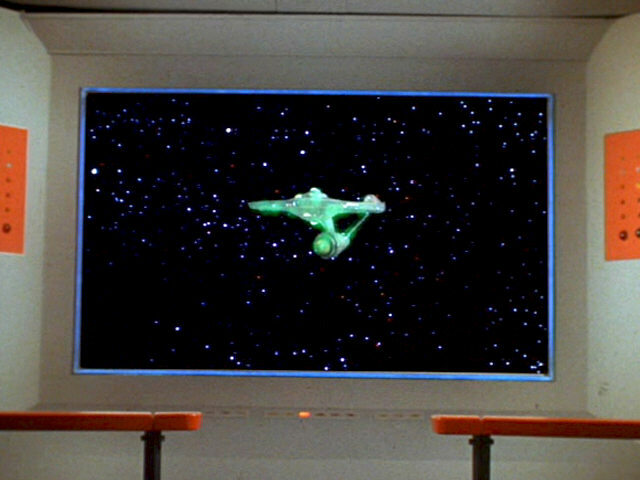 The model gets re-used in TOS: "The Ultimate Computer", here acting as a contemporary automated freighter. 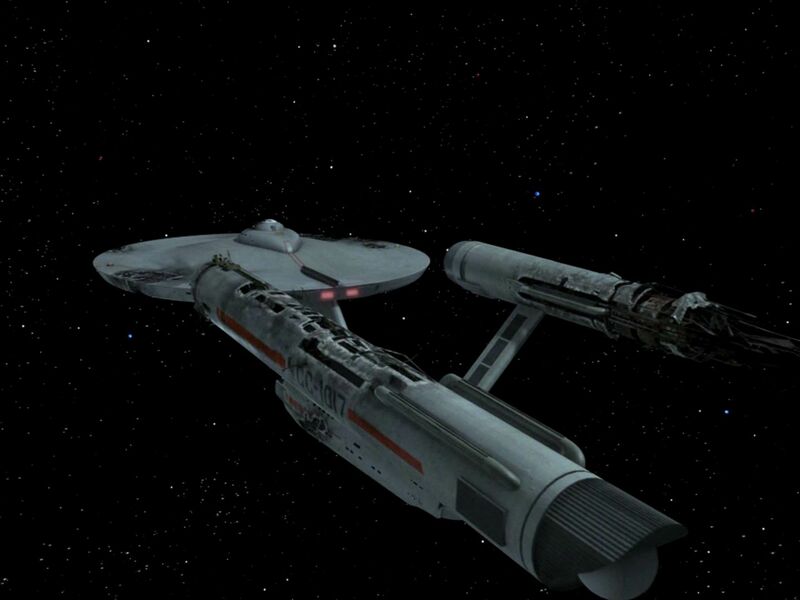 Botany Bay (TOS: "Space Seed") A CGI model of the Botany Bay, DY-100 class, was created for the remastered TOS episode, realistically weathered but faithfully following the lines of the original. Mike Okuda: "You can't see it in this image, but the top of the 'conning tower' now has a tiny circular docking port, very similar to those used on the real-life International Space Station. The docking port was added at the suggestion of a former NASA engineer who noted that a spacecraft built in 1996 would probably have included such equipment to dock at the station." 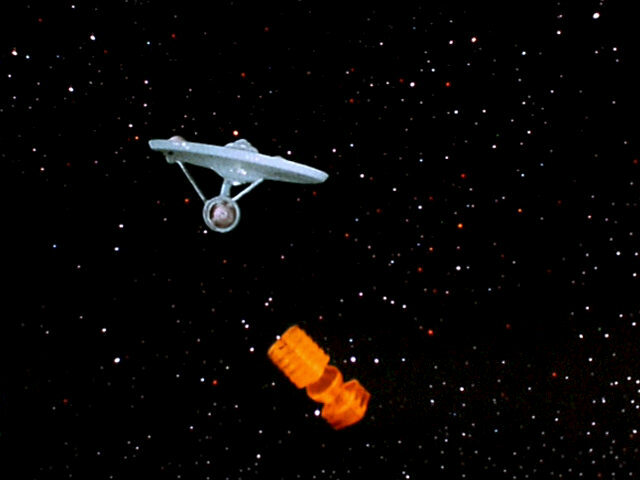 Woden (TOS: "The Ultimate Computer") In TOS-R the unfitting vessel was replaced with the cargo drone from TAS. 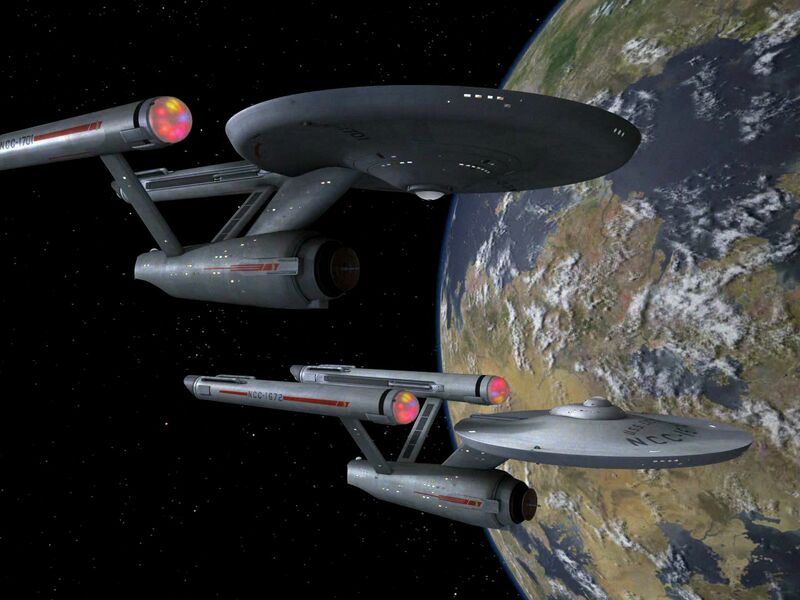 The design had previously been adapted to serve as the USS Antares in TOS-R: "Charlie X", but there with a new crew section that was omitted for the Woden. 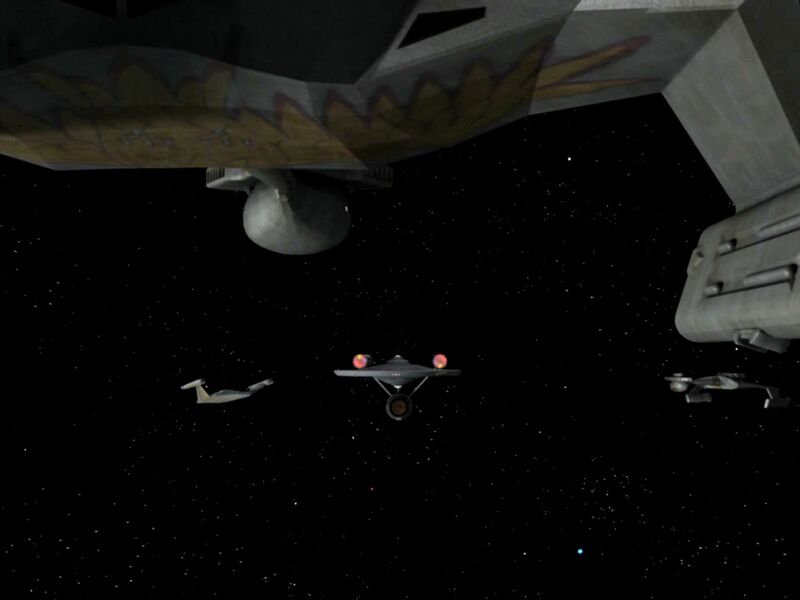 The registry is NCC-325, indicating that the Woden is probably a Starfleet freighter and numbered in the same fashion as a "real" manned ship. 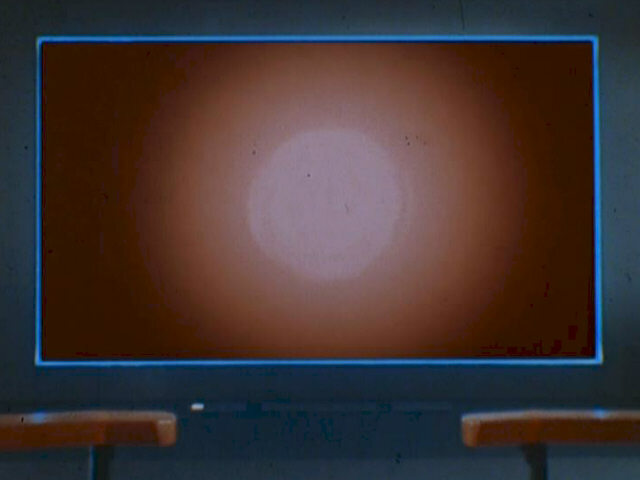 The same miniature acts as the famous station K-7 in TOS: "The Trouble with Tribbles" and (using stock footage) for the somewhat less prominent Starbase 6 in TOS: "The Ultimate Computer". This has never been a problem to explain because they could easily be the same design. 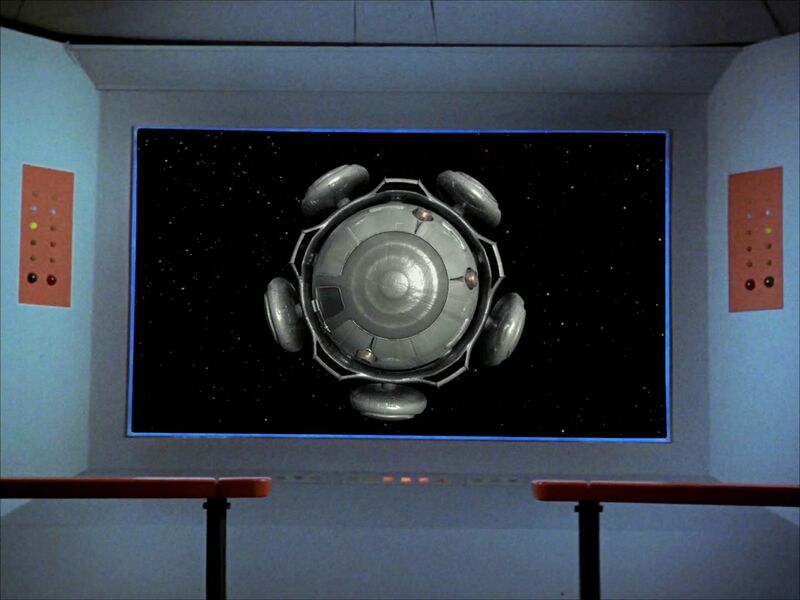 Deep Space K-7 (TOS: "The Trouble with Tribbles") The K-7 miniature was replaced by a CGI reconstruction in TOS-R.
Starbase 6 (TOS: "The Ultimate Computer") A new station appears in TOS-R: "The Ultimate Computer", where it replaces the stock footage of Deep Space K-7. This station was designed by Masao Okazaki. 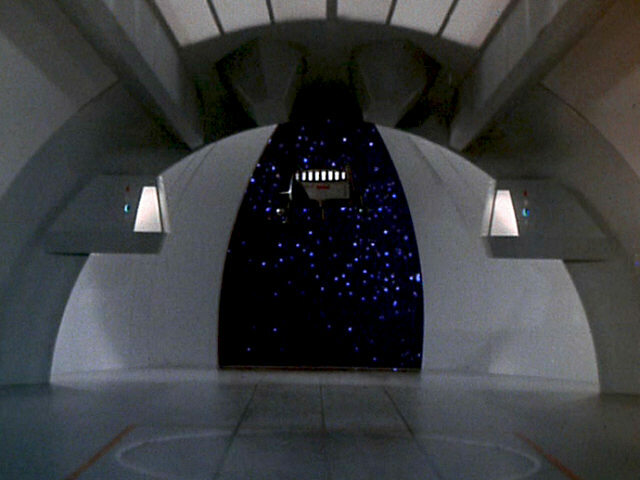 It first appeared as the J-Class station in the Starfleet Museum and was later adapted for the Starbase 47 "Vanguard" in the Star Trek Vanguard series by David Mack. 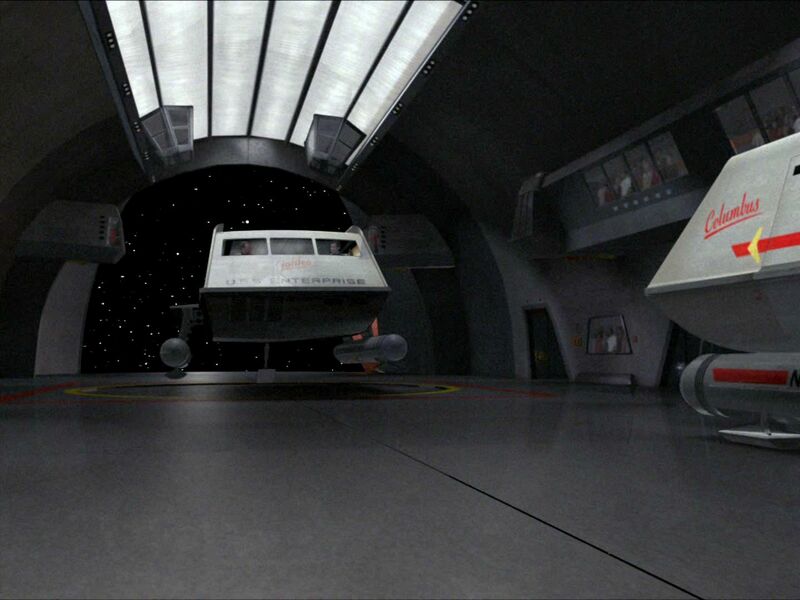 The station is labeled "Starbase 6", although this is not readable in any of the shots. 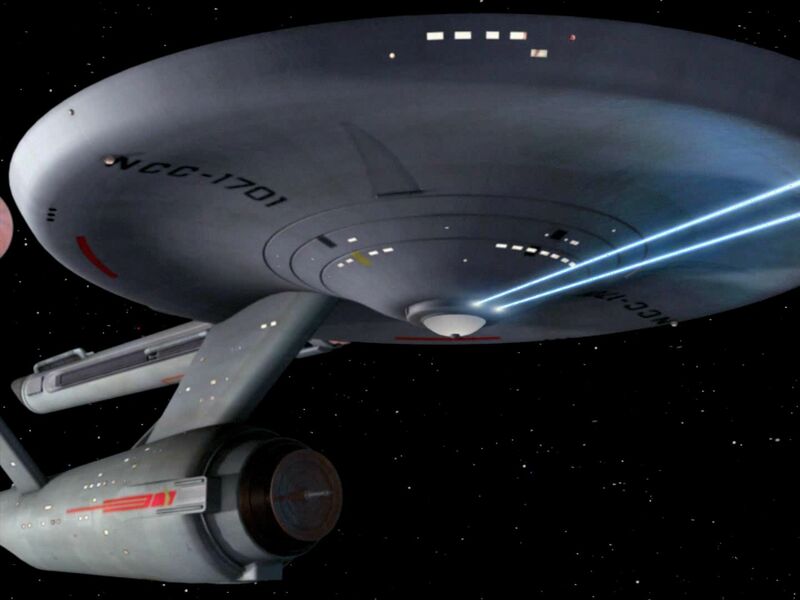 It has been scaled down for TOS-R.
Mike Okuda: "I asked CBS-D to re-scale Masao's station in 'The Ultimate Computer' because I did not want it to dwarf the Enterprise or the Lexington. If you look very closely, you may notice a tiny red smudge on the side of the station, which is the UFP banner from 'And the Children Shall Lead.'" 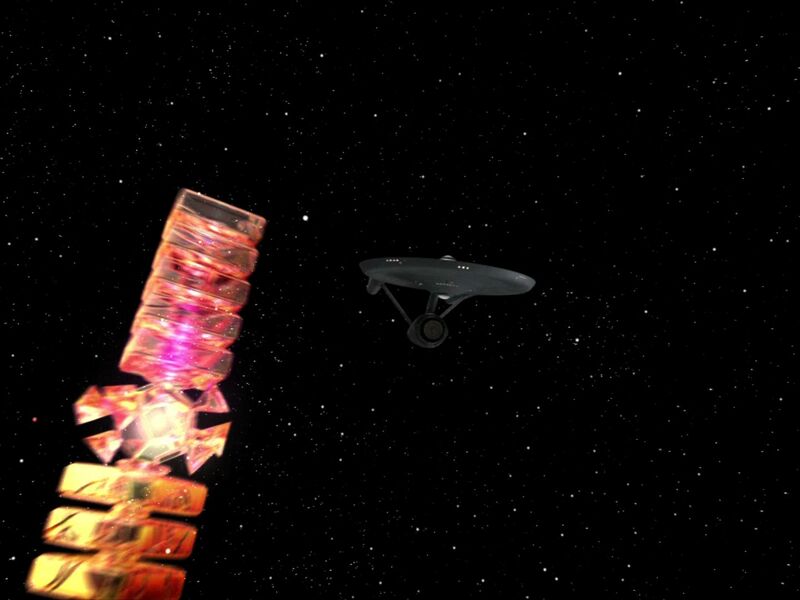 TOS: "The Tholian Web" shows several of the characteristic cone-shaped vessels of the mysterious Tholians. 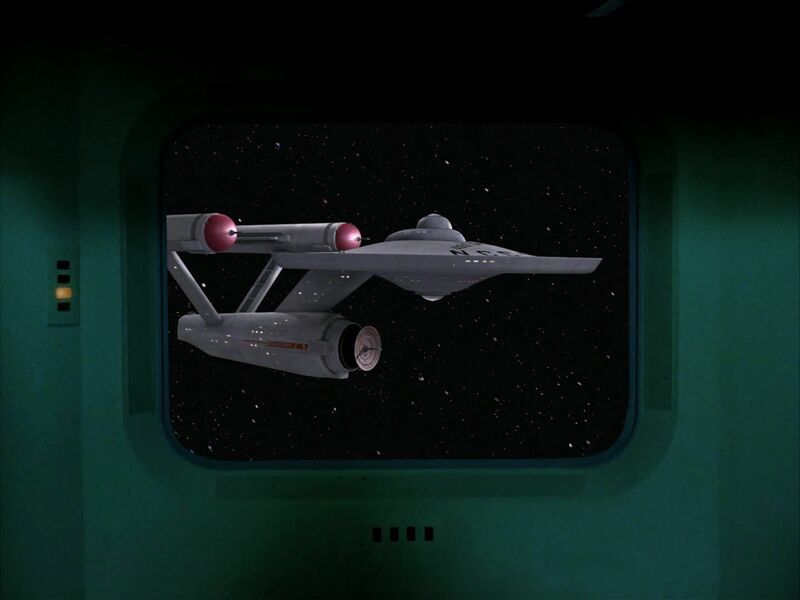 The ship miniature, now with warp nacelles affixed to it, returns for TOS: "The Way to Eden" as a civilian cruiser of the Federation. Tholian web spinner (TOS: "The Tholian Web") For TOS-R: "The Tholian Web" the vessel was retconned in a way to still resemble the original web spinner, with orange engine glow in the place of the area that used to be simply red. 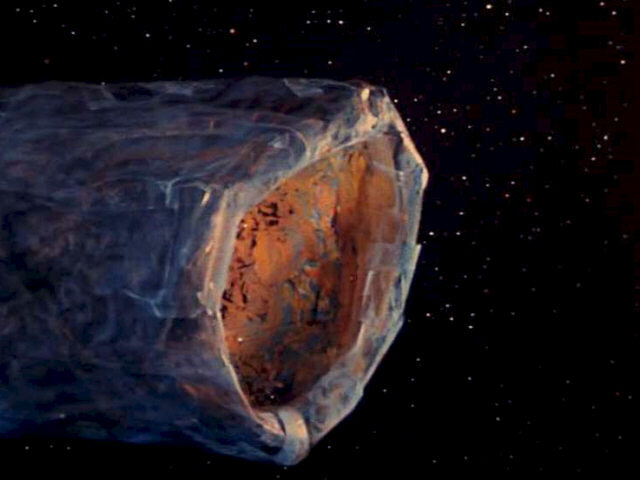 The design aesthetics are the same as of the 22nd century Tholian ship from ENT. 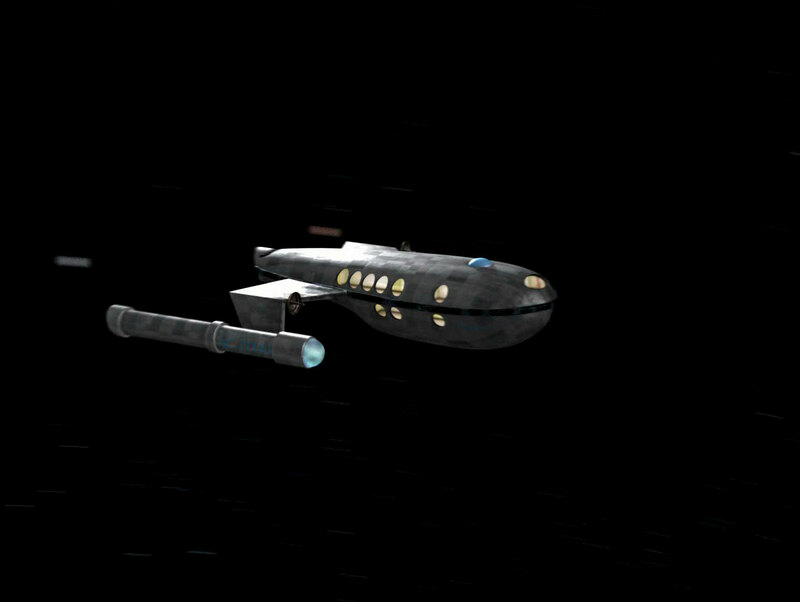 Aurora (TOS: "The Way to Eden") The new Aurora in TOS-R: "Way to Eden" is a simple tubular design with two warp engines. 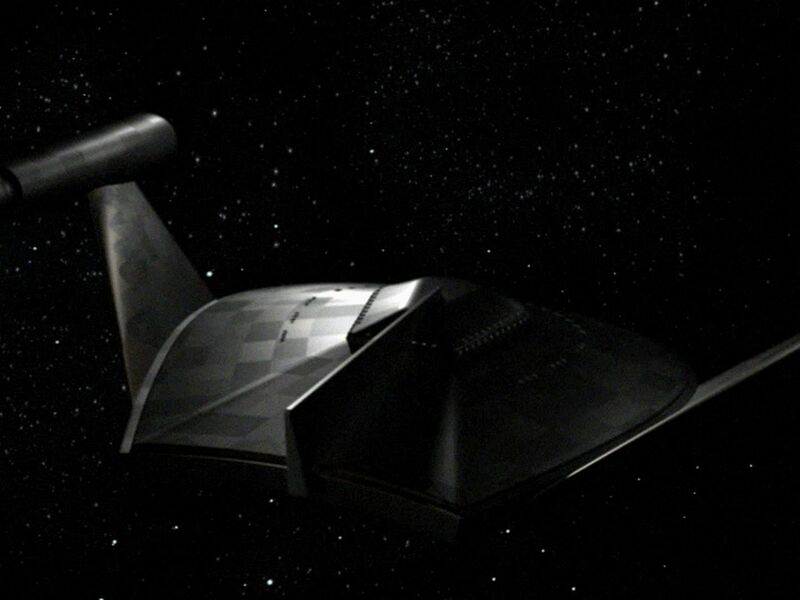 Mike Okuda: "It's a modified version of Mudd's ship [J class]. Registry number NC-17740... The registry number is from Matt Jefferies's airplane. Actually, I have a vague memory that we may have used that number for another ship, earlier, but I wanted to do that for Matt in his own show." See Matt Jefferies's airplane on display. The asteroid shots first appeared in "The Paradise Syndrome" and were later re-used for the asteroid-ship Yonada, only differently colored. Yonada (TOS: "For the World is Hollow and I Have Touched the Sky") Yonada was given a different look in TOS-R, more realistic because very dull and much darker in the absence of a star. 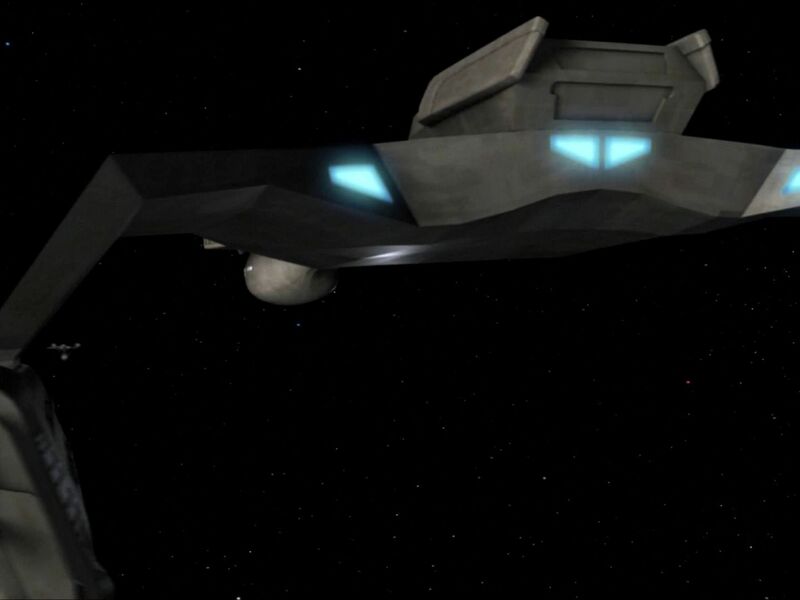 The original Klingon battlecruiser designed by Matt Jefferies appeared in no more than three TOS episodes: as a Klingon ship in "Elaan of Troyius" and "Day of the Dove", and as a Romulan vessel of Klingon origin in "The Enterprise Incident". 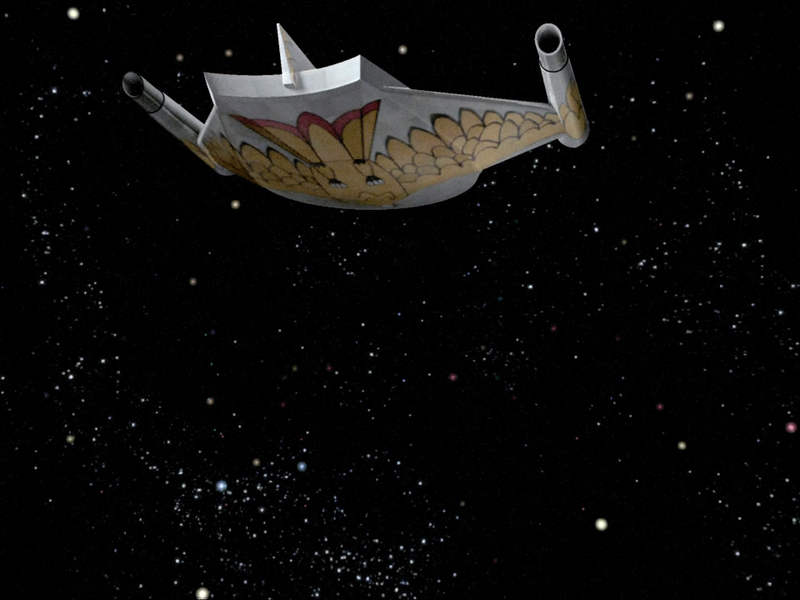 Klingon D7 (TOS: "Elaan of Troyius", "Day of the Dove") In these two episodes the Klingon cruiser miniature was replaced with a new CGI that most notably includes "real" windows and lighted impulse exhausts. Also, a slight hull paneling was added. 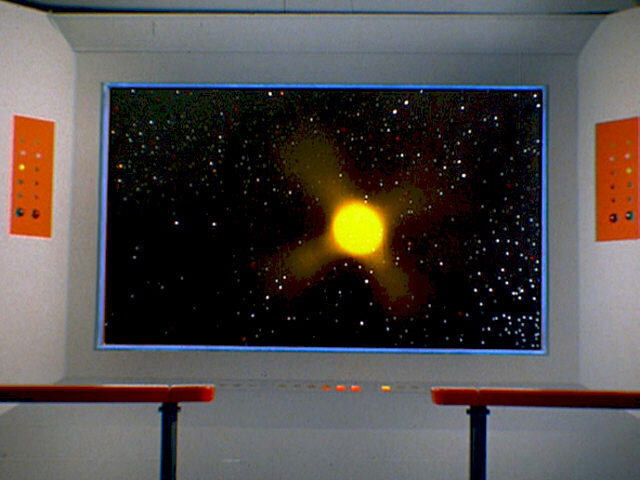 D7s were newly inserted into three more episodes: TOS-R: "Errand of Mercy", "Friday's Child" and "A Private Little War". 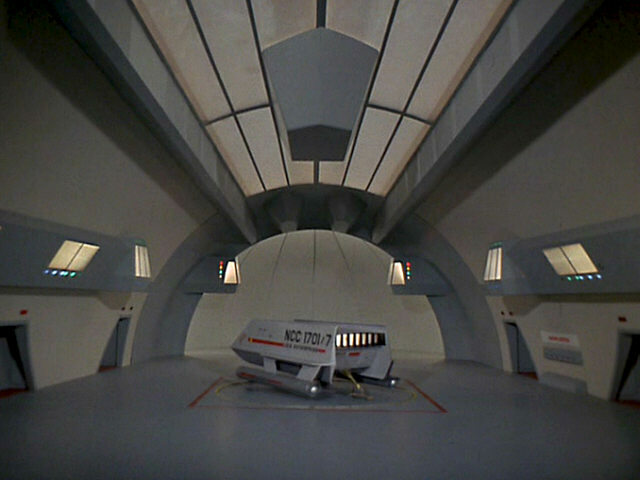 Interestingly, in "Friday's Child" the cruiser, rather than a new design, replaces a Klingon scout ship that used to be just a bright blurry shape. 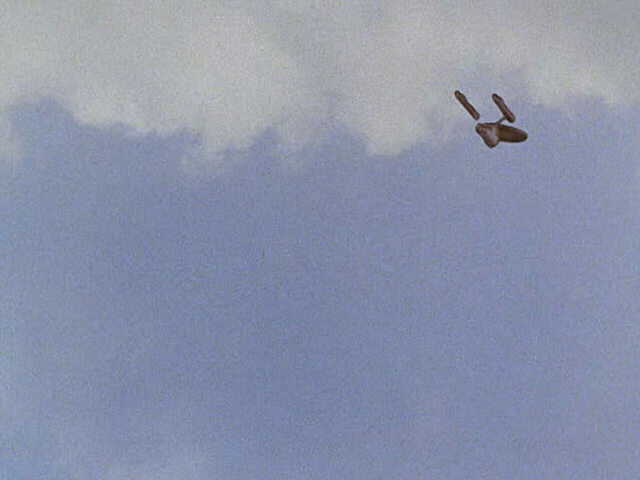 Romulan D7 (TOS-R: "The Enterprise Incident") The D7s were given a Romulan bird pattern on the ventral hull. Also, one of them was replaced with a Bird-of-Prey. 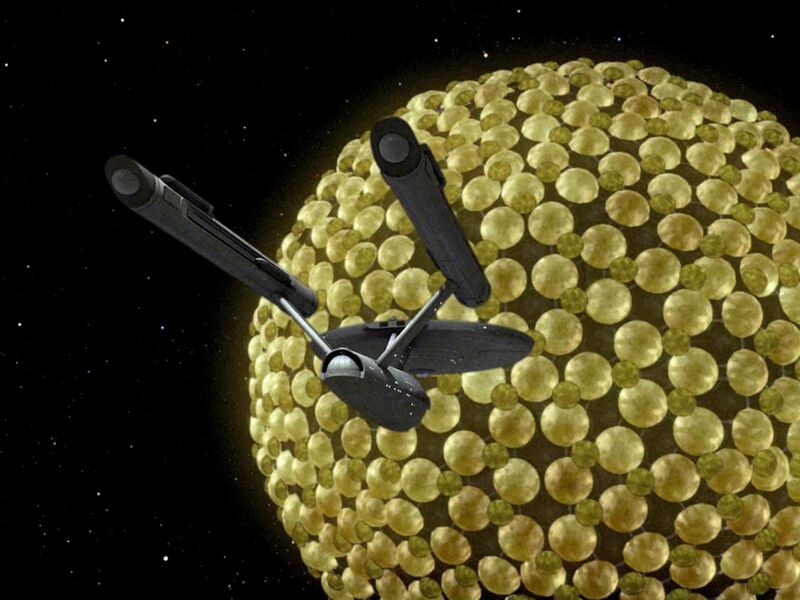 IKS Gr'oth (TOS: "The Trouble with Tribbles") The Gr'oth, built as a miniature by Greg Jein, had already appeared in DS9: "Trials and Tribble-ations". 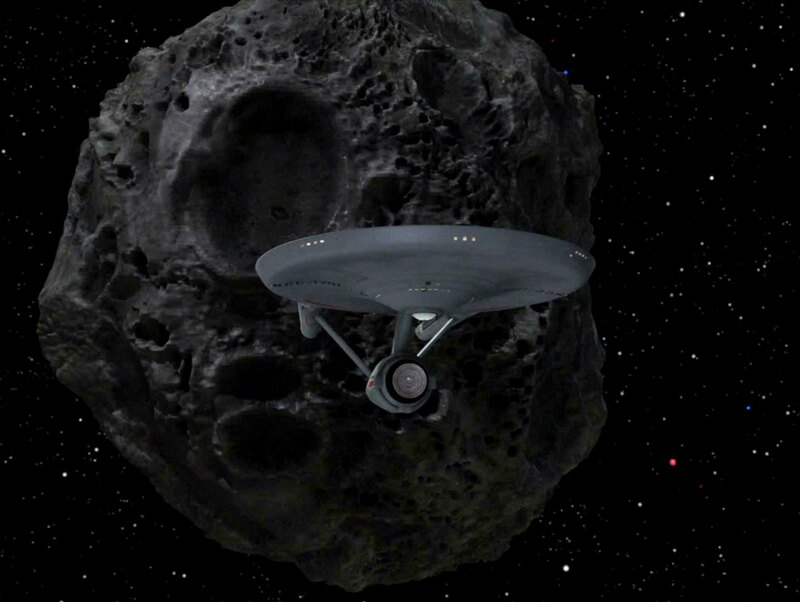 The ship was retroactively digitally inserted into the remastered version of TOS: "The Trouble with Tribbles". Most likely the new CGI, seen only from a distance, is a reproduction of the original D7, rather than including Jein's exact revisions such as the greenish hull. 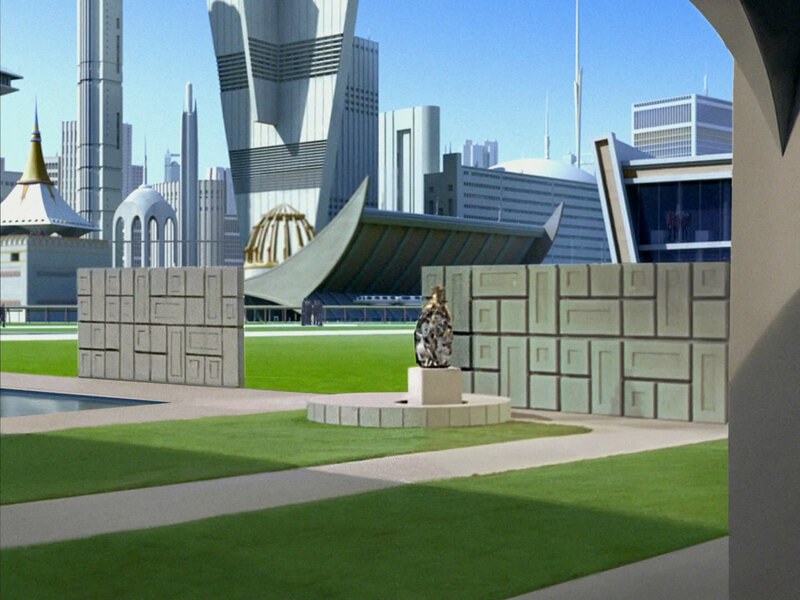 But this would be clearly overruled by the definite visual evidence from the DS9 episode. 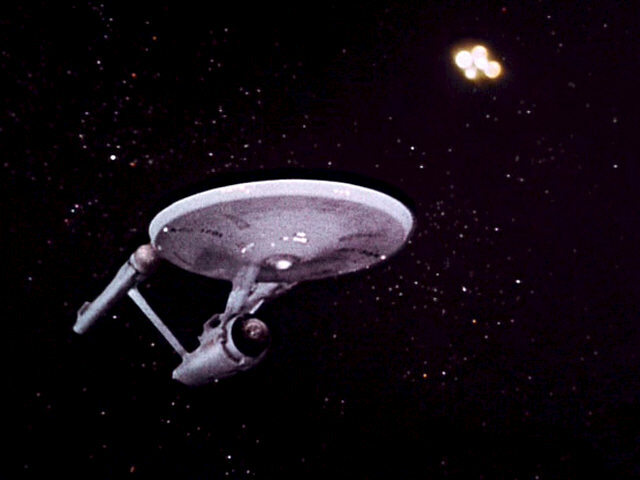 The following starships were not re-used during TOS. Still, almost all of them received a makeover for TOS-R.
First Federation buoy (TOS: "The Corbomite Maneuver") The buoy was reconstructed for the remastered version. It looks the same as in TOS but not quite as blurry. 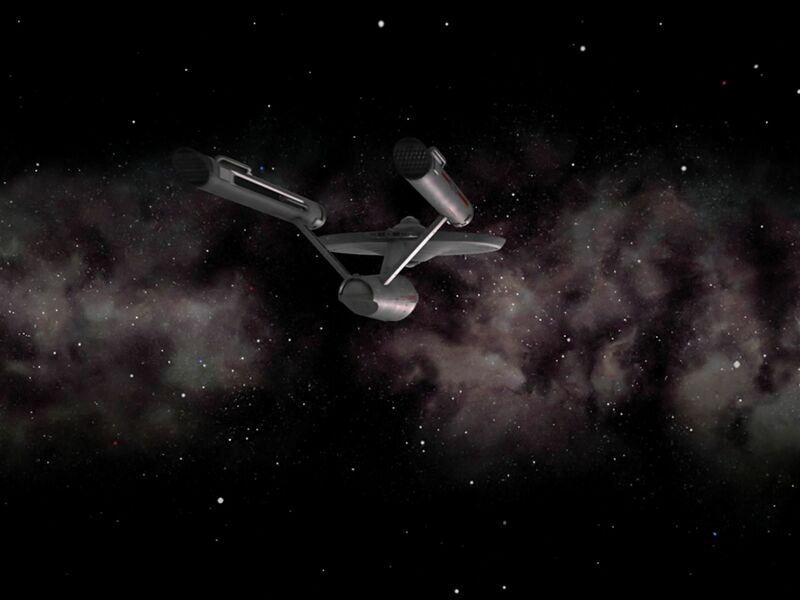 First Federation scout ship (TOS: "The Corbomite Maneuver") The scout ship was reproduced for TOS Remastered analogous to the mothership. The glowing of the ship until it is disabled is now bright yellow instead of reddish. 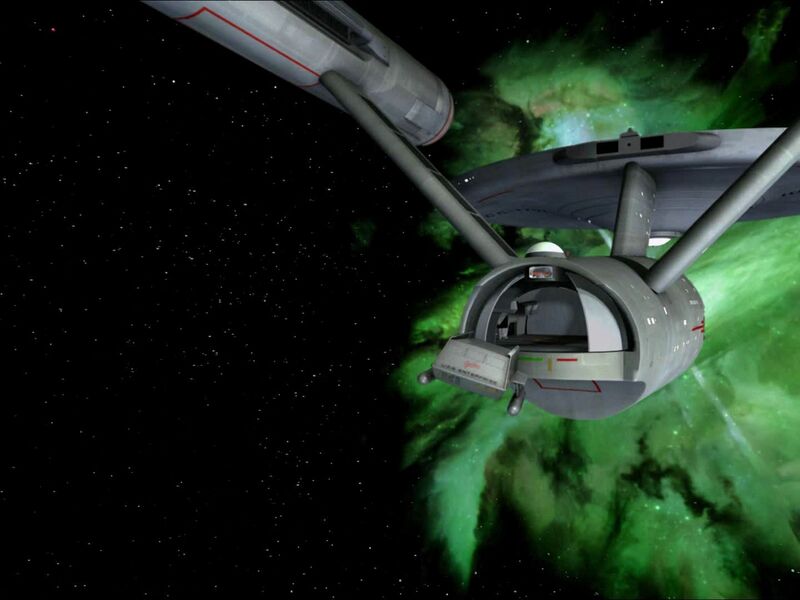 Fesarius (TOS: "The Corbomite Maneuver") The Fesarius was considerably refined for TOS Remastered. 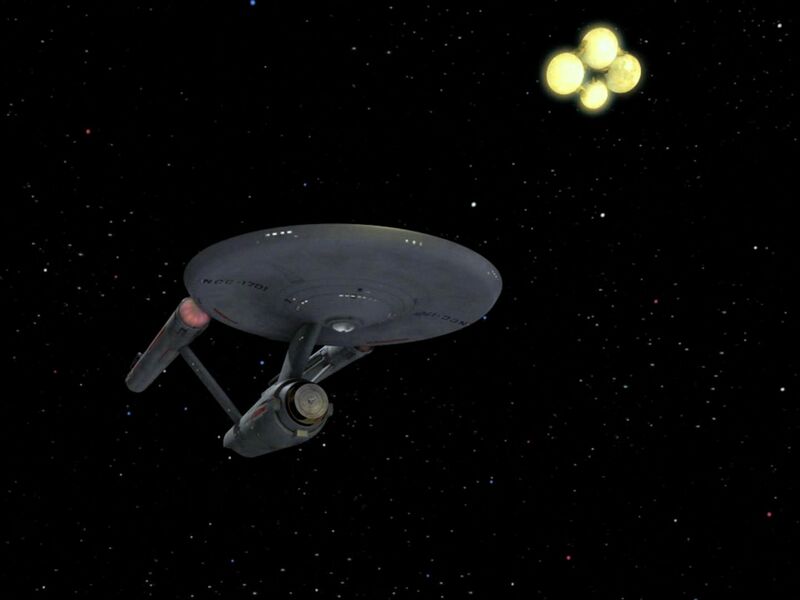 The arrangement of the hull segments with its characteristic balls is still the same, as is the size relative to the Enterprise (at least roughly). Most obviously facets were added to the previously smooth single balls that the ship is composed of. Also, a framework is visible between the balls. Although these features are new and were apparently not on the original Fesarius, we may attribute both to the crisper image quality. We could pretend that we previously simply couldn't recognize these details. Also, the color seems to have changed from dirty orange to golden. But the color may have just been corrected for an overly red hue in the old footage. 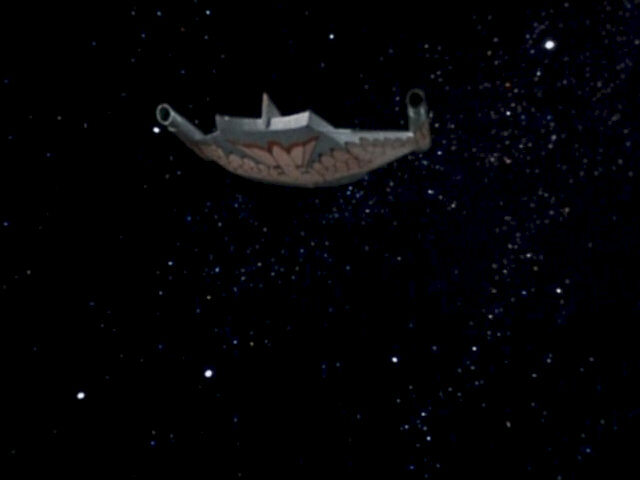 Romulan Bird-of-Prey (TOS: "Balance of Terror", "The Deadly Years") In the remastered versions of the two TOS episodes the top side of the Romulan BoP was shown from previously unseen angles and was given a hull grid and a more metallic looking surface than we may have expected. The underside with the bird depiction still looks like in TOS but now possesses a subtle hull grid too. 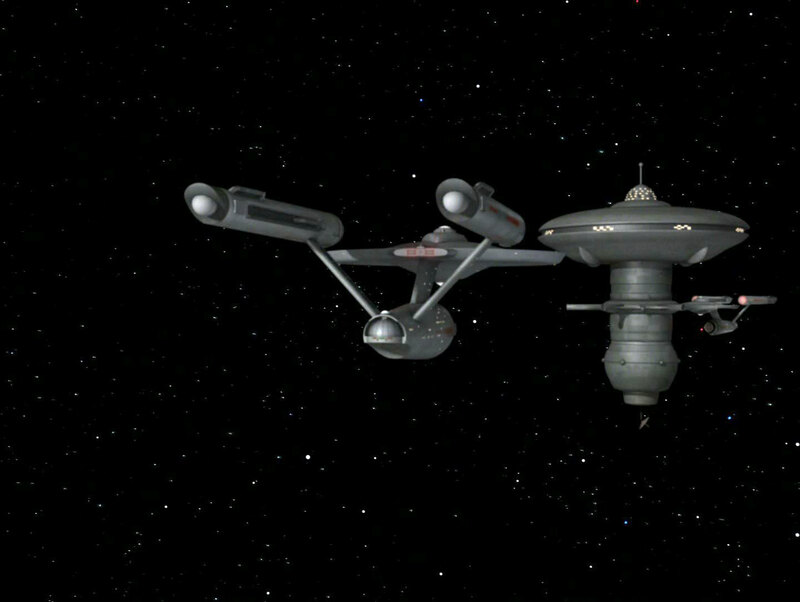 The BoP also appears in TOS-R: "The Enterprise Incident", here replacing one of the previously three D7 battlecruisers. 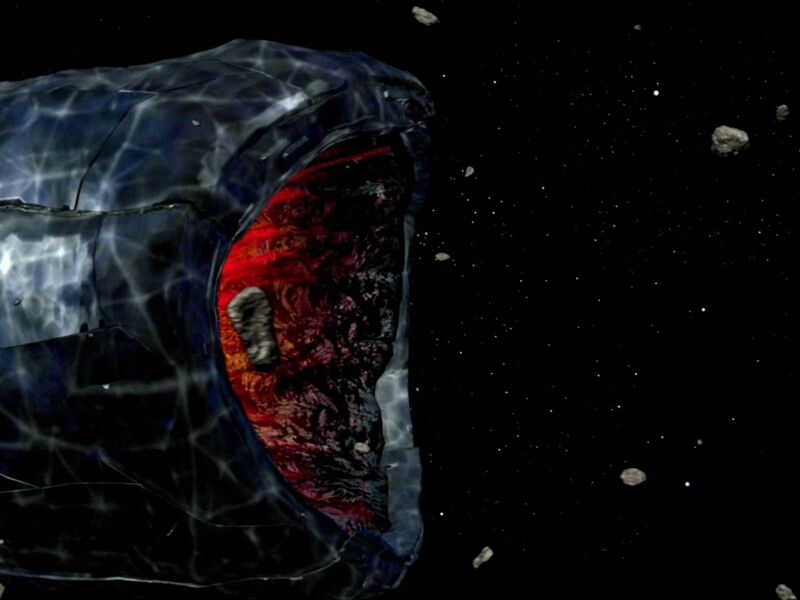 Planet Killer (TOS: "The Doomsday Machine") All visual effects involving the Planet Killer were redone with a new CGI model in the remastered episode. Its irregular hull shape and structure is close to the original. If it is not quite the same, it will be hardly recognizable anyway because we are shown the Planet Killer from somewhat different angles now. 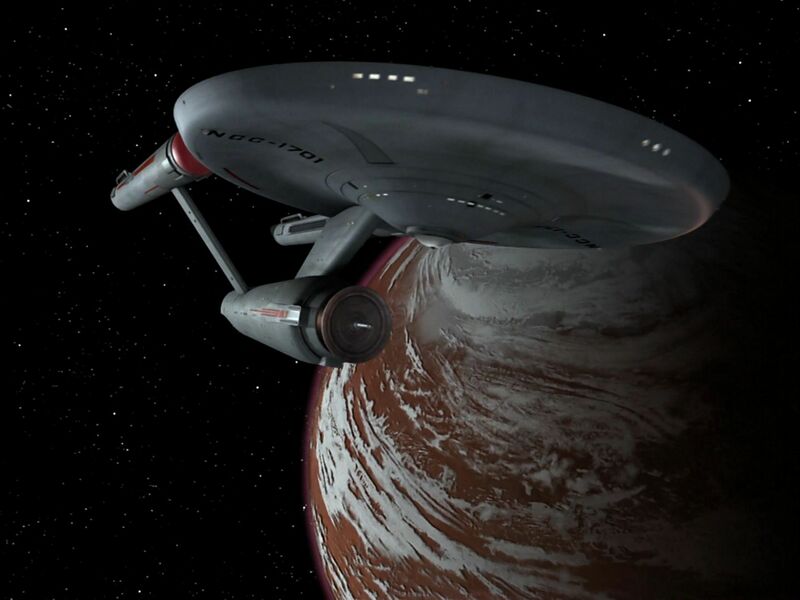 At startrek.com, Dave Rossi, producer of Star Trek Remastered, says about the hull structure: "We wanted to honor the original concept, and in fact, we researched some original story notes in which [writer] Norman Spinrad described the planet killer as bristling with weapons. At the same time, we wanted to retain as much of the original model design as possible. We gave the new planet killer a texture reminiscent of hammered titanium and solid lava, trying to indicate that the surface of the machine had been pounded by untold arsenals over the aeons." All light effects like the reactor inside, the weapon beams and the exhaust of the dying machine were even more noticeably upgraded. Melkotian buoy (TOS: "Spectre of the Gun") The CGI model of the buoy built for the remastered episode has the a similar basic structure and is semitransparent too, but has been visibly redesigned. Eymorg ship (TOS: "Spock's Brain") The Eymorg ship was completely redesigned for TOS-R to a ball with five engine pods. The rationale, according to CBS: "...The comparison between the original and the remastered version provides two totally different looks, with styles defined more by the contemporary technology. The original is a standard rocket-shaped configuration. 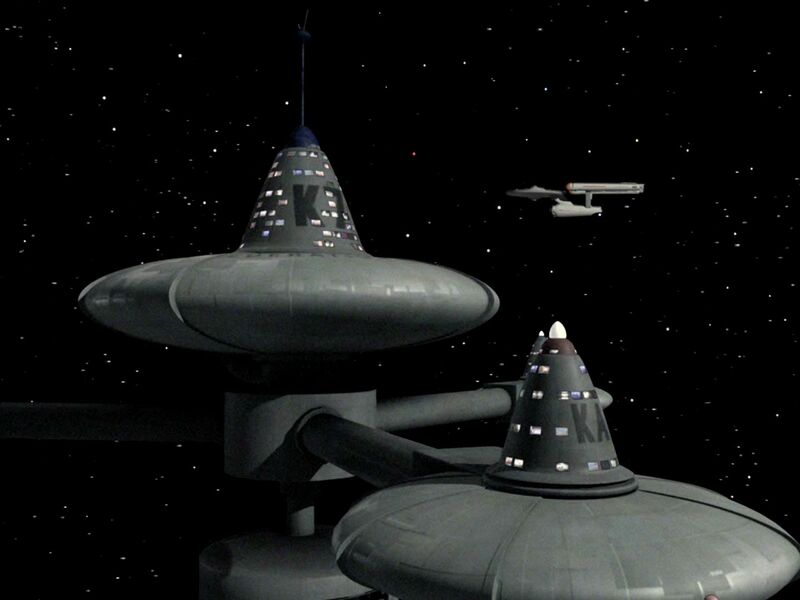 At the time, 'spaceships' tended to fall into a one of two classic looks, the other being the the flying saucer. The new, remastered version of the ion propulsion craft is smaller and more utilitarian, reflecting its single-person occupancy, and it ditches the unnecessary missile/rocket configuration. The design also reflects more modern-day ion propulsion prototypes." 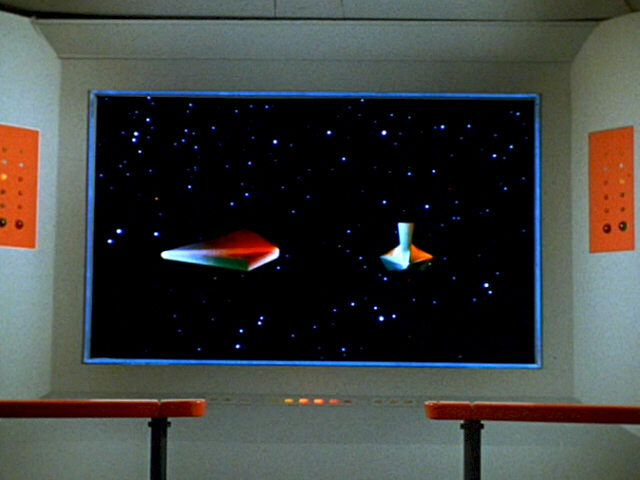 Fabrini missiles (TOS: "For the World is Hollow and I Have Touched the Sky") In the remastered version of the episode the simple tubes were replaced with somewhat more detailed CGI versions. 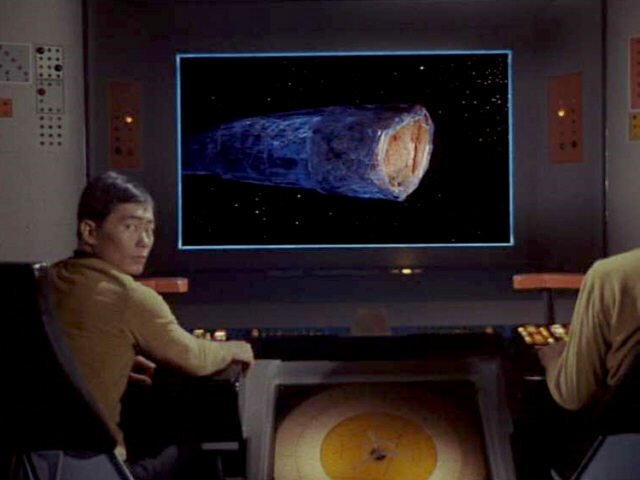 Mike Okuda: "The Fabrini missiles had a triangular cross-section, reflecting the Fabrini design style." 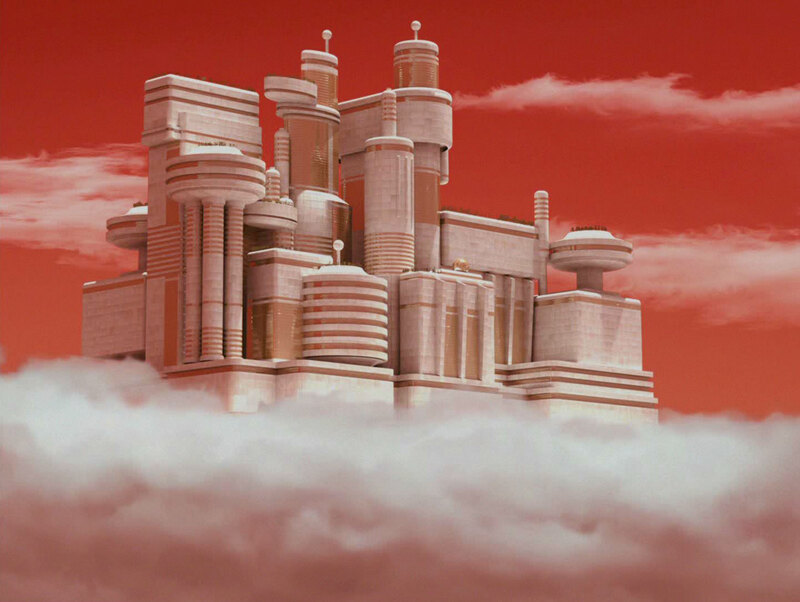 Ardana (TOS: "The Cloud-Minders") The cloud city of Stratos was represented by a small model dangling from the studio ceiling in the TOS episode. For TOS-R the various shots of Stratos from the surface were replaced with all-new matte paintings with more detail and realism. 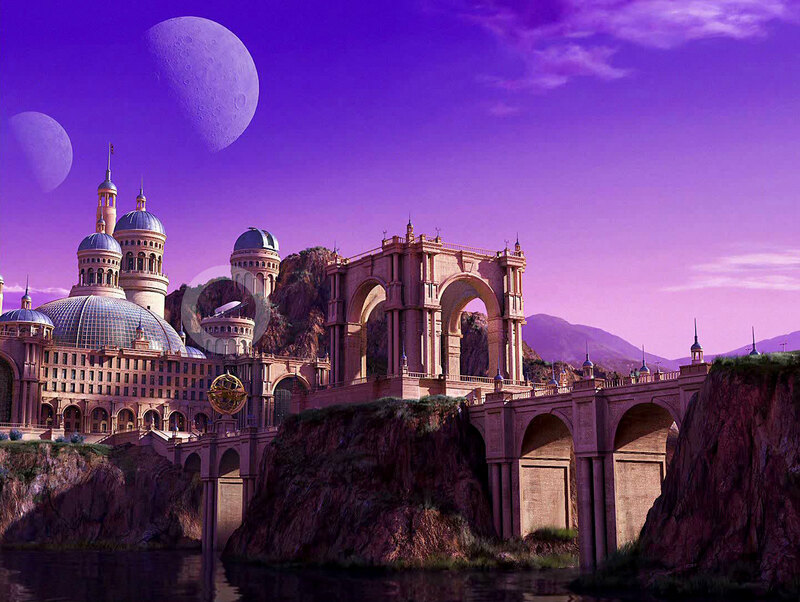 The city's structure (now CGI) and the colors remained largely the same. 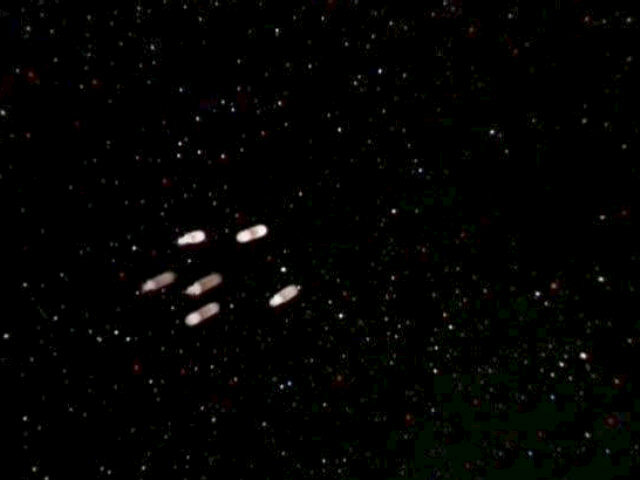 Some TOS starships were created with simple means and hence looked like diffuse light spots or generic illuminated shapes. 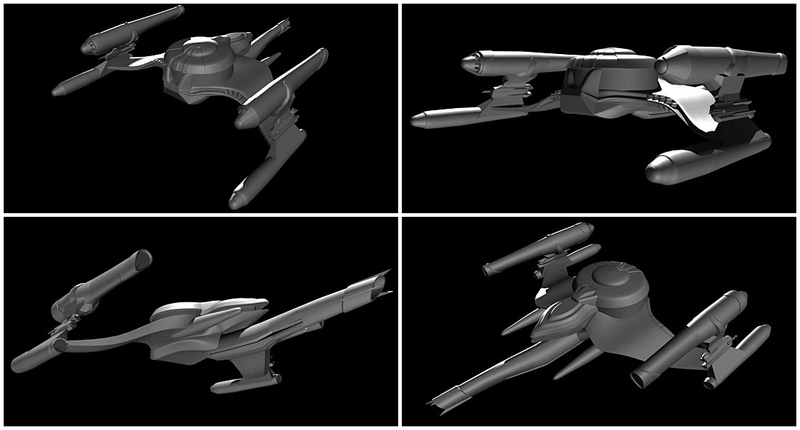 All of these were redone for TOS-R to look like real vessels. 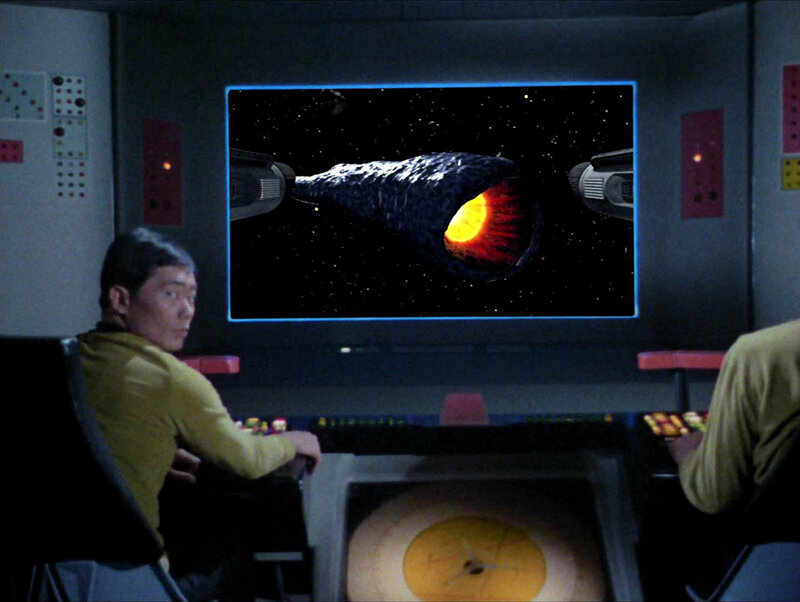 Thasian ship (TOS: "Charlie X") In TOS-R the Thasian ship is actually shown, albeit just as a maze of blurry tubes. 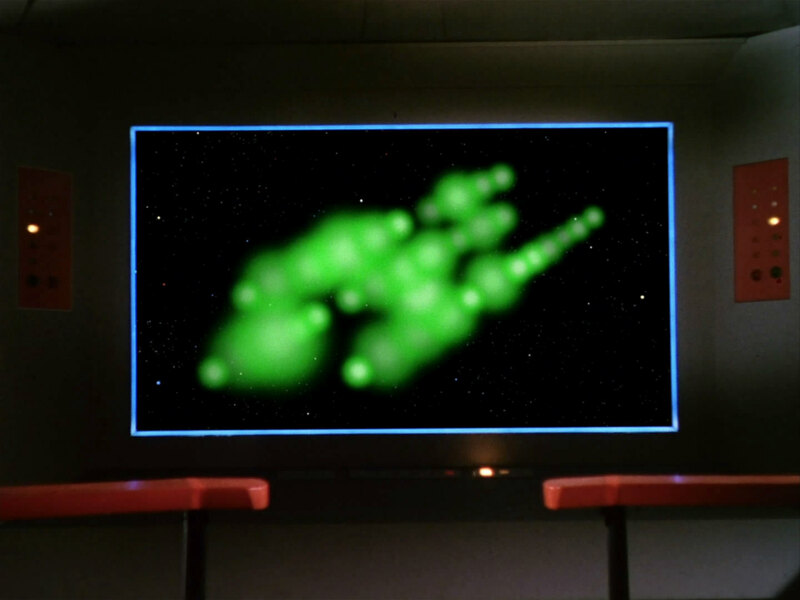 The green glowing and fading effect is still reminiscent of the cloud that appeared in TOS. 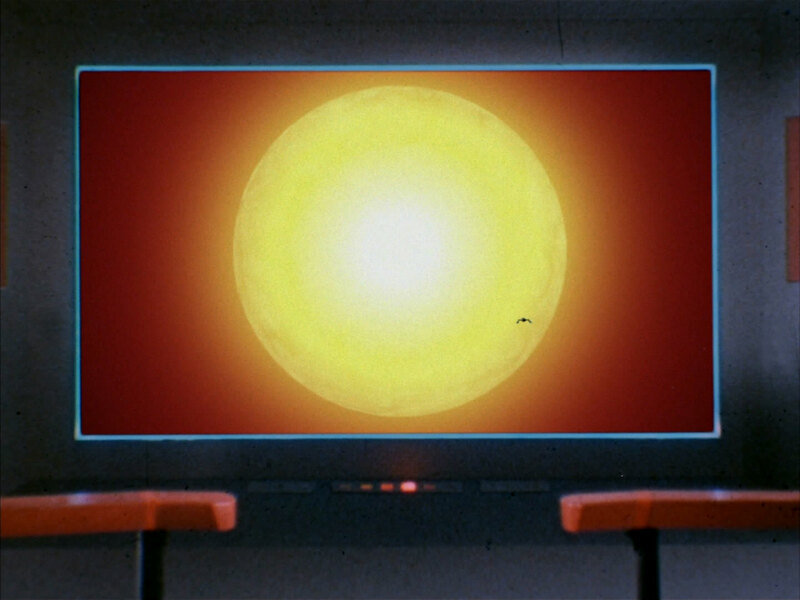 Class J (TOS: "Mudd's Women") In the remastered update of "Mudd's Women" the glowing light on the viewscreen was replaced with something that looks much more like a "real" starship with two warp nacelles and a central impulse engine, all with a bright blue glow. 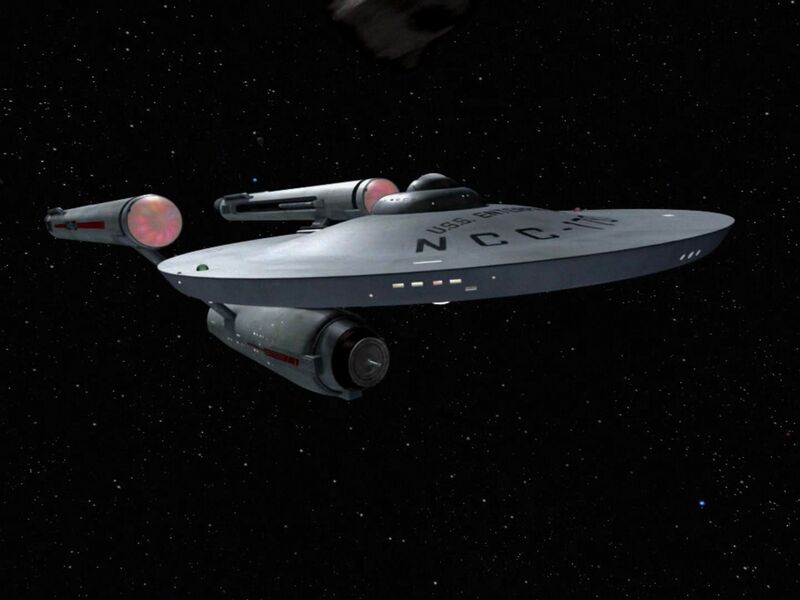 This new TOS-R ship bears no resemblance to the J class from Enterprise either. 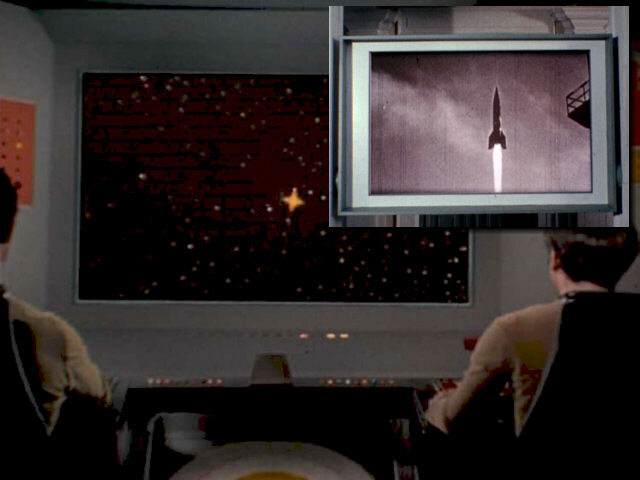 Ekosian rocket (TOS: "Patterns of Force") In the remastered episode we can see a CGI rocket from a distance on the Enterprise's viewscreen instead of just a red light. 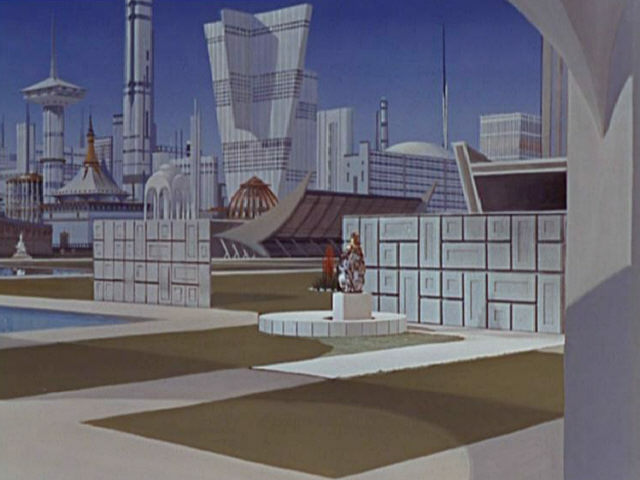 The design is based on the German V2, of which stock footage appears later in the episode. 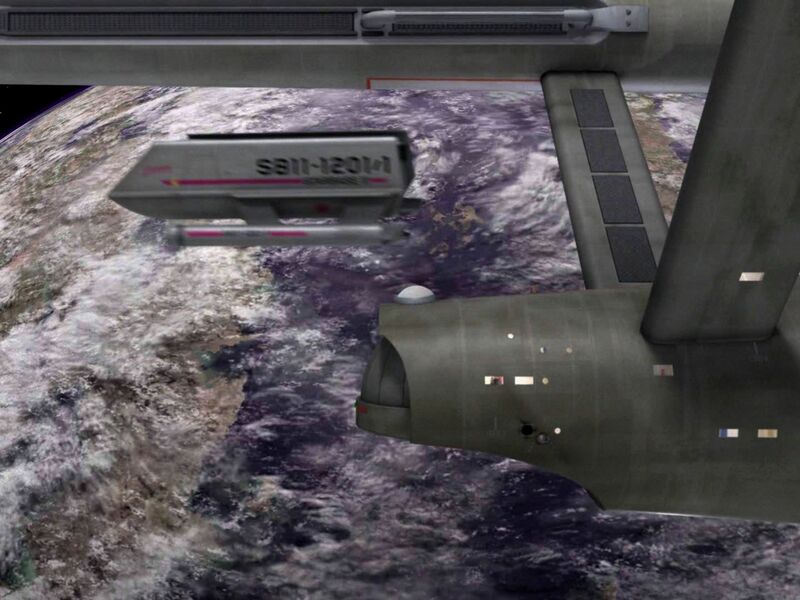 Mike Okuda: "The Ekosian missile is based very closely on the German V2 ballistic missile. I don't think it was very clearly visible in the episode, however." 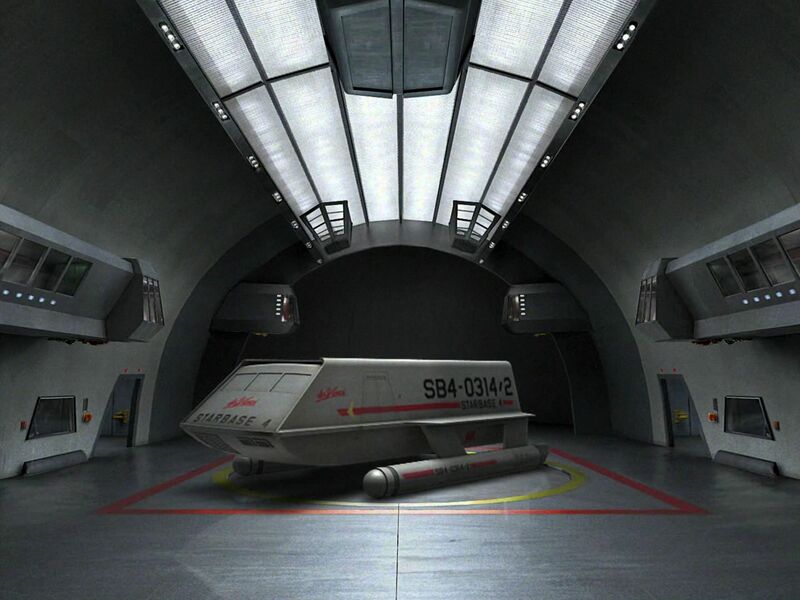 Orion intruder vessel (TOS: "Journey to Babel") For TOS Remastered a detailed CGI model of the ship was inserted into the scene. Its engines are arranged in a circle and roughly produce the same effect as the spinning light in the old episode. 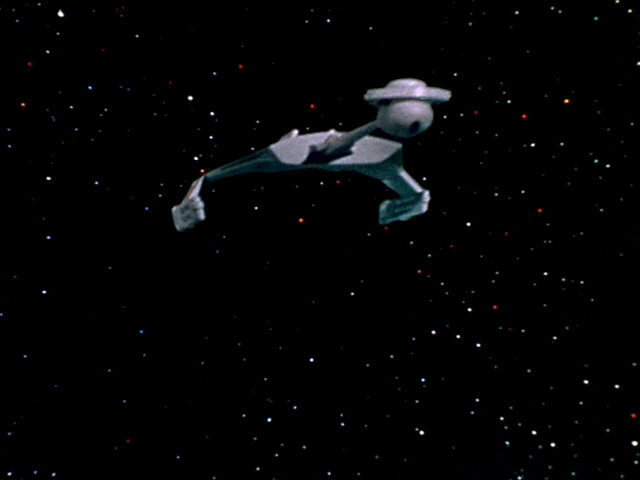 Klingon scout (TOS: "Friday's Child") The vessel was completely eliminated from the enhanced episode and replaced with a standard D7. If we should go with TOS-R as the only canon, the scout ship would be non-existent. 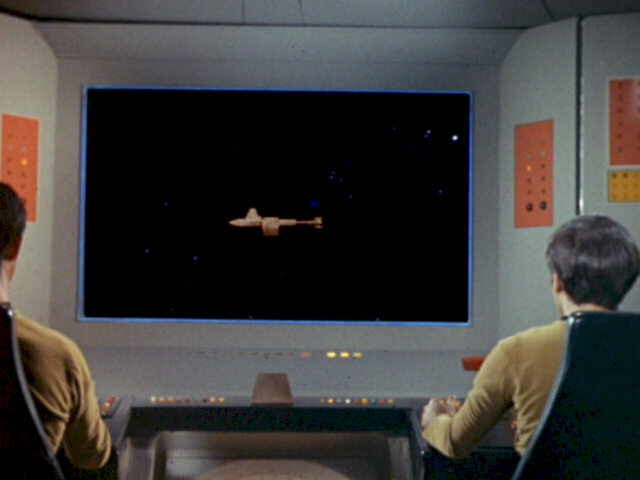 Some starships were newly created for TOS-R, filling in where a vessel should or could have been shown in TOS. 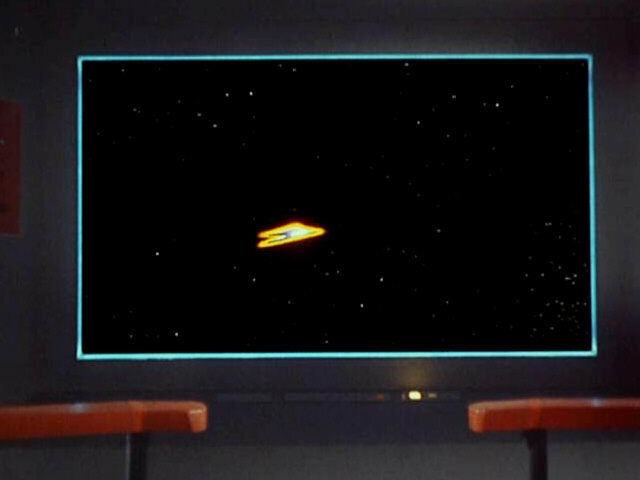 USS Antares (TOS: "Charlie X") The previously unseen Antares was finally shown in the remastered version of the TOS episode of 2007. Its design was laid out to be reminiscent of the freighter Woden (TOS version aka DY-100) according to startrek.com. 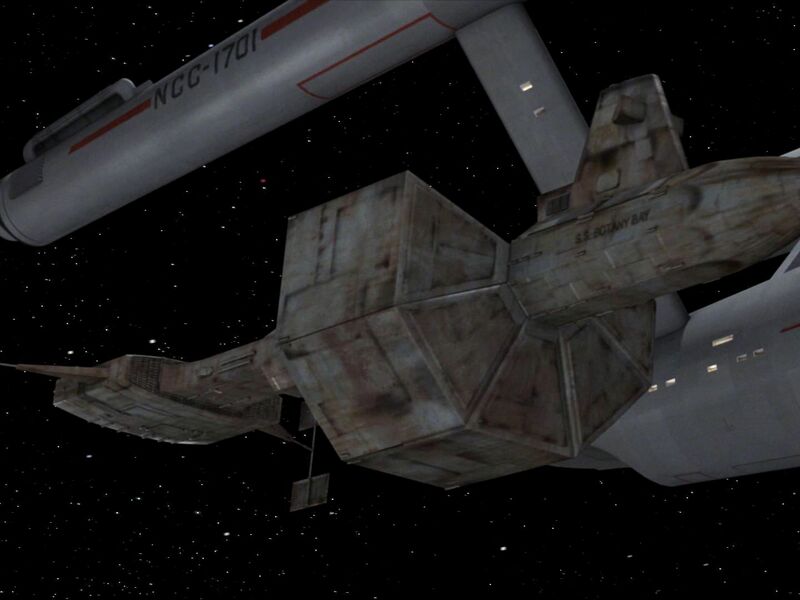 However, it evidently looks much rather like the TAS cargo drone. 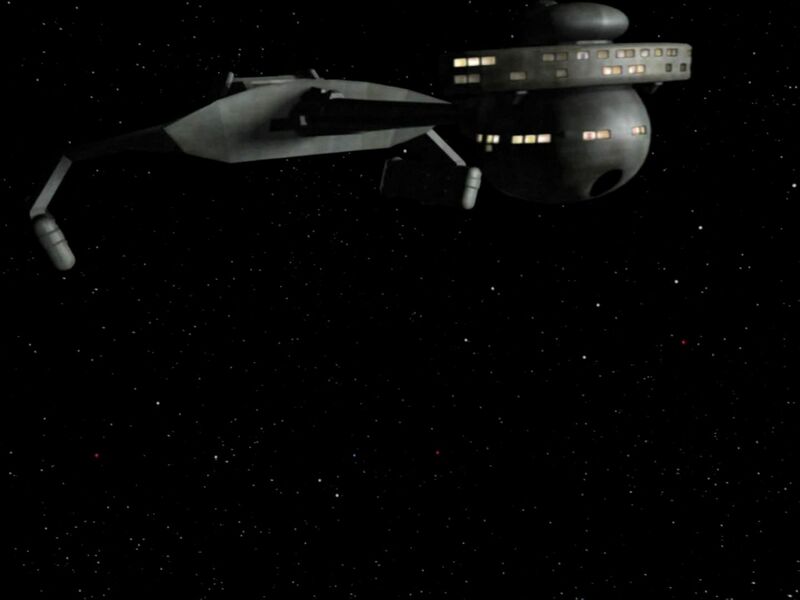 USS Yorkshire (TOS: "Court Martial") Another vessel of the same class as the Antares briefly appears in orbit around Starbase 11, behind the Enterprise and the Intrepid, in the first second of TOS-R: "Court-Martial". 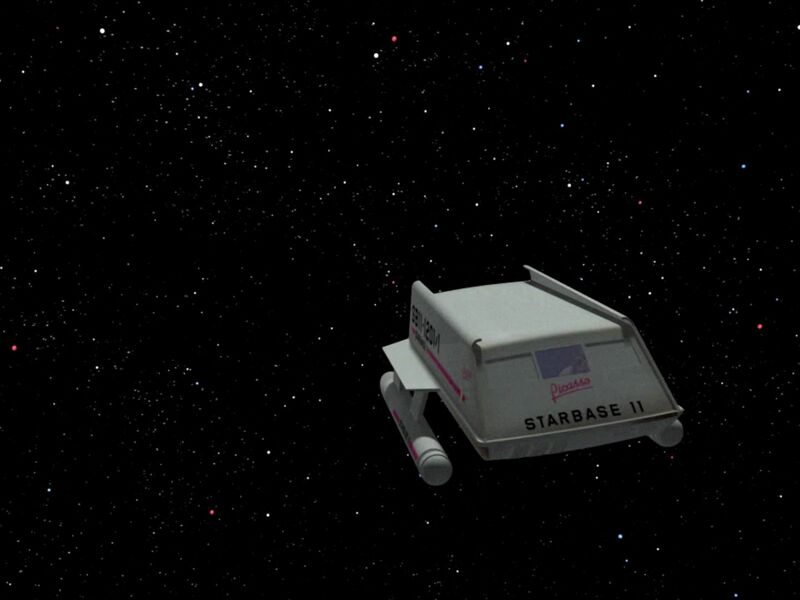 Mike Okuda: "An Antares-type ship [Yorkshire NCC-330] also appears in orbit above Starbase 11 in 'Court Martial,' although it's pretty tiny in the frame." Ion pod (TOS: "Court Martial") The ion pod that was only mentioned in the dialogue in TOS (and where Finney was allegedly killed) can be seen on the starboard aft end of the ship in TOS-R.
Gorn ship (TOS: "Arena") This CGI ship was inserted into the far background of the previously empty viewscreen for TOS-R: "Arena" in 2006. 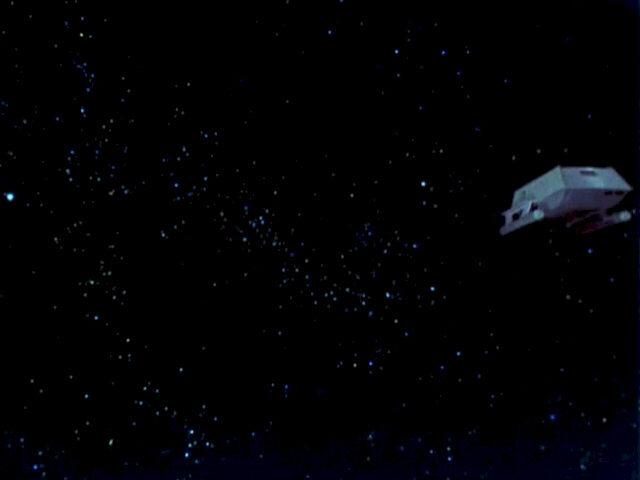 Only a main body and something like wings and nacelles are recognizable on screen. 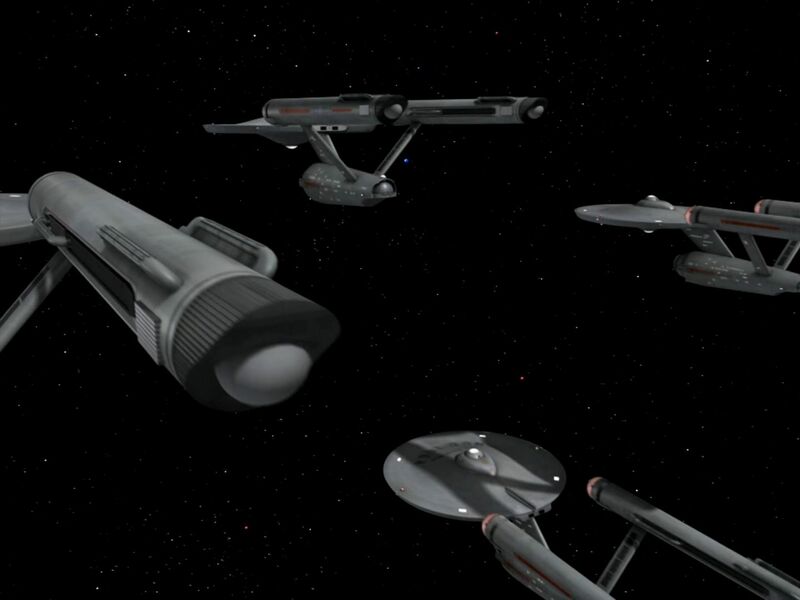 In the views of the CGI model as posted at startrek.com the vessel seems to have four nacelles. Eminiar VII train system (TOS: "A Taste of Armageddon") Among other changes and refinements, two previously non-existent tracks of what appears to be a system of hovertrains were inserted into the matte painting of Eminiar VII for TOS-R: "A Taste of Armageddon". 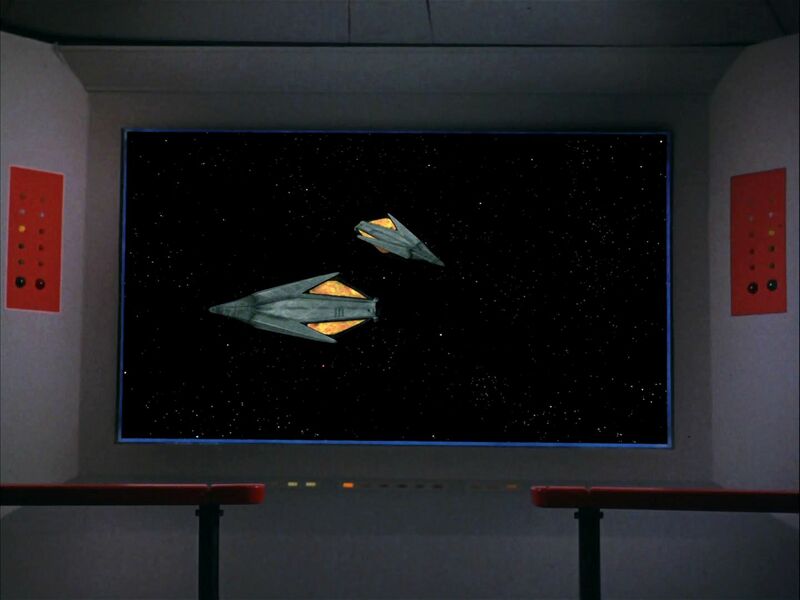 Denevan ship (TOS: "Operation: Annihilate!") 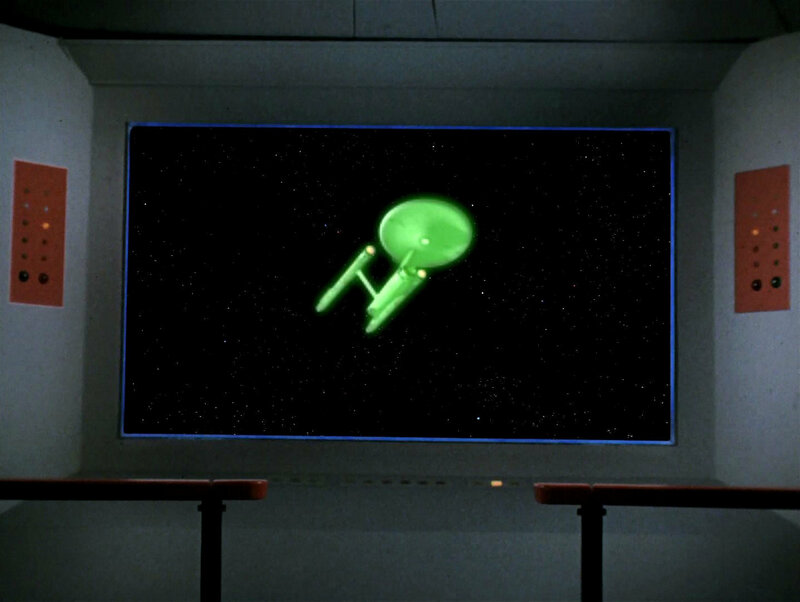 The vessel only shows up in the remastered episode TOS-R: "Operation: Annihilate!". 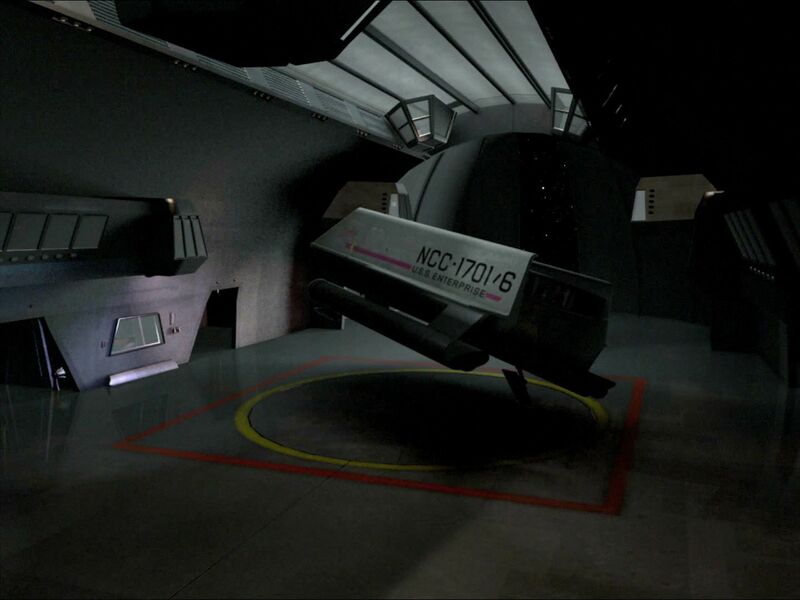 As confirmed by Michael Okuda, It is the same model as Mudd's Class J (TOS-R), but supposedly much smaller. 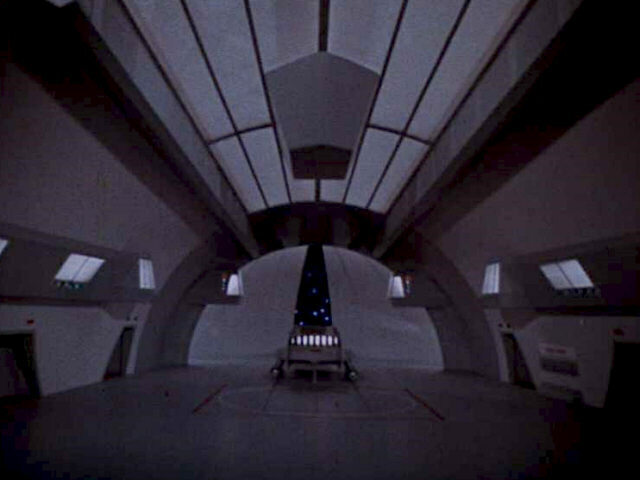 Since the vessel is barely visible anyway, we may assume it is actually a distinct design "of Denevan configuration", as stated in the episode. Ultraviolet satellite (TOS: "Operation: Annihilate!") 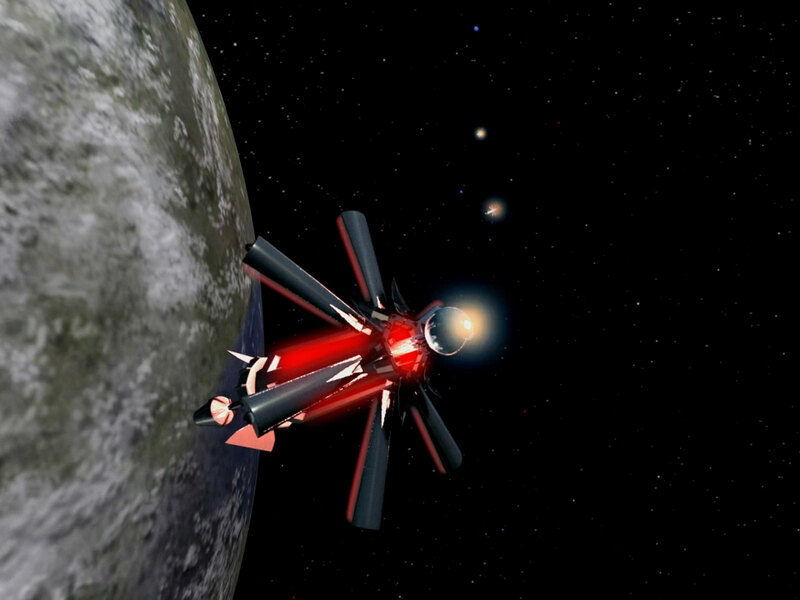 We can see the satellites for the first time in the TOS-R version of "Operation: Annihilate!". It remains unknown whether the no less than 210 deployed satellites were specially constructed to fight the neural parasite infestation on Deneva. Most likely the basic satellites were ready-made standard devices with power supply, radio receivers and attitude control. But they needed to be rigged at least with the ultraviolet emitters that don't sound like they could be available on standard-issue satellites or buoys. A lot of work for Scotty and his staff! 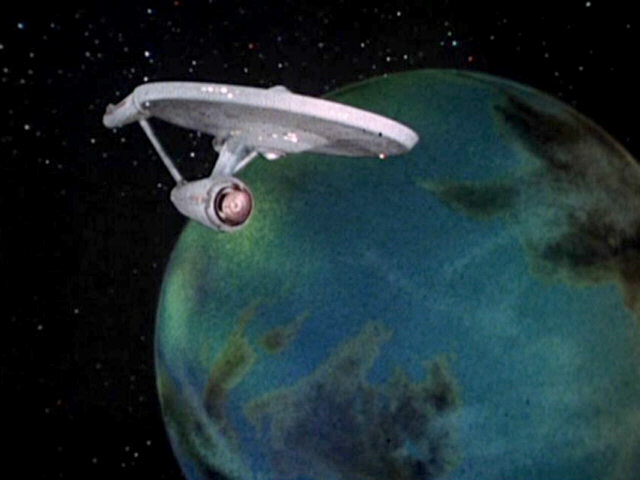 Medusan starship (TOS: "Is There in Truth No Beauty?") 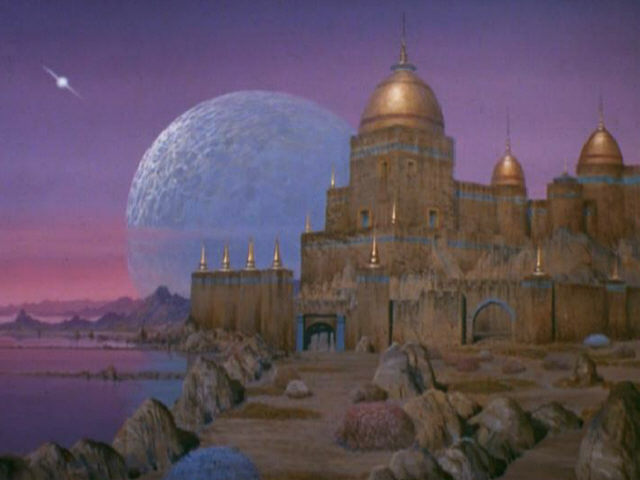 The planet that was still visible in TOS was removed altogether from the TOS-R version and was replaced with a new Medusan starship. It bears a certain similarity to the Daedalus class. Mike Okuda: "Sorry, we didn't put a name or a registry number on that ship. The basic idea was Dave Rossi's suggestion. He thought that because the Medusans were non-corporeal and might not have developed technology as we know it, they might use Federation hardware, so their ships could have a distinct Federation style." 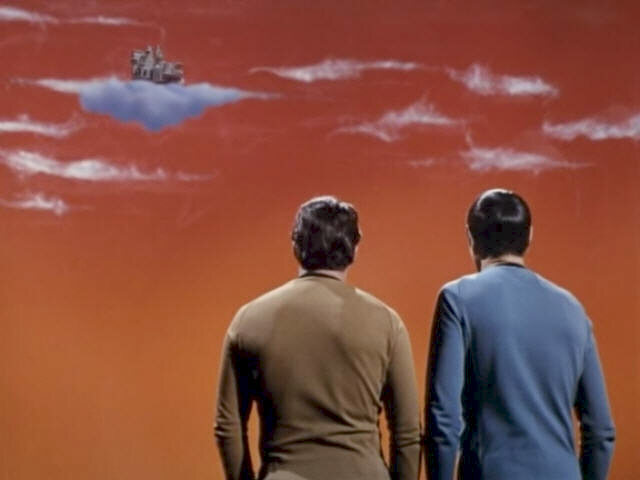 Flint's shuttle (TOS: "Requiem for Metuselah") The shuttle is visible on the revised matte painting of the planet Holberg 917-G (previously just a reuse of the castle from "The Cage"). The ramp may be a homage to science fiction movies of the 1950s, where such a launch method was commonplace (well, and to the NX prototypes). Max Gabl: "The model of the building and the shuttle was one of the 3D models supplied by [visual effects supervisor] Niel Wray." 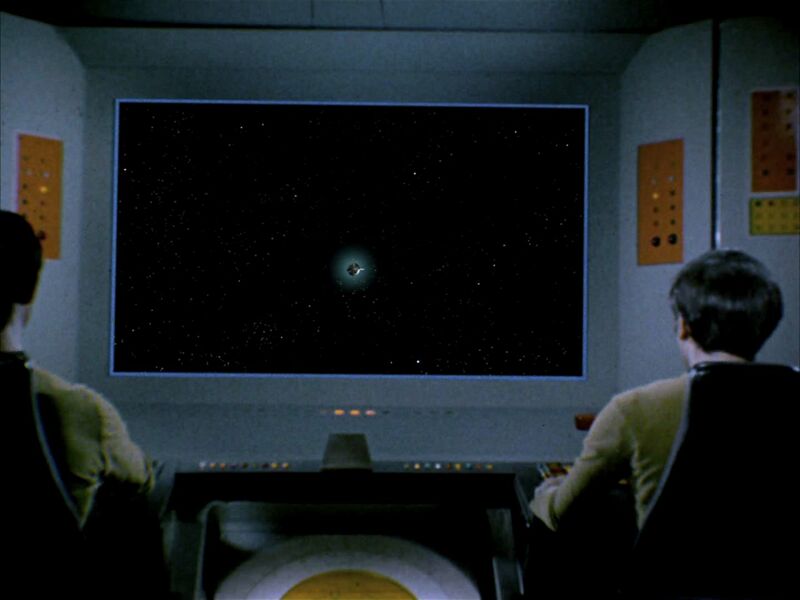 Special thanks to Matt Wright who did most of the TOS-R screen caps for Trekmovie.com. Thanks to Ambassador for correcting facts about the Enterprise model and to Stefan Posner for spotting a small dissimilarity of the ships in TOS-R: "The Ultimate Computer".